Click flyer image to register for the event and for sponsorship & advertisement options. What a day at the Rye Nature Center and their Old-Fashioned Winter's Afternoon. Thanks to all that came out and volunteered their time! 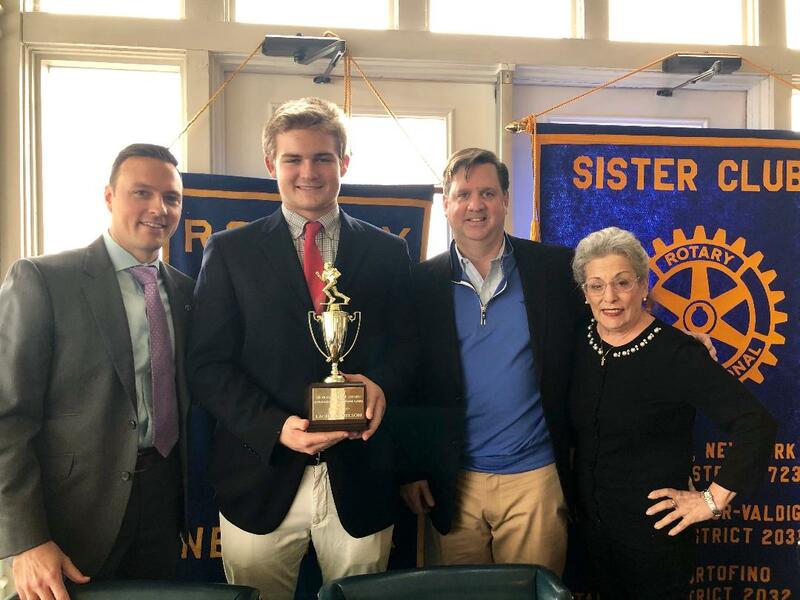 Two RHS athletes were awarded the Rye Rotary Sportsmanship Award at a Rotary Club luncheon at Whitby Castle held on January 5. Brett Egan, RHS class of 2017, and Peter Chabot, RHS class of 2018, received their trophies from Rotary President Bob Manheimer. The sportsmanship award is given annually to athletes exemplifying the ideals of sportsmanship during the annual Rye-Harrison football game. The winner is nominated by members of the Harrison Huskies football team. Congratulations to Peter and Brett, their parents, and coaches. 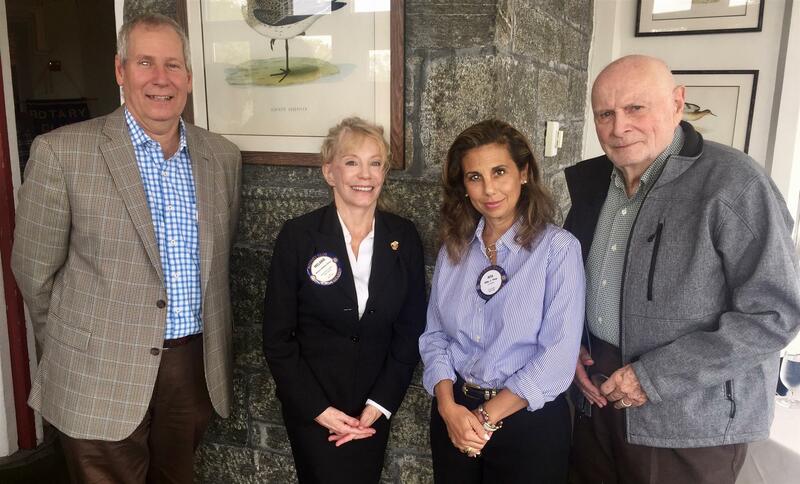 Pictured below (l to r): Rye Rotary President - Elect Angela Sculti, Past District Governor and Rye Rotarian Lora Hugelmeyer, Ossining Rotary President Cecilia Gutierrez, District Governor - Elect Kris Chittur, and Rye Rotary President Bob Manheimer. 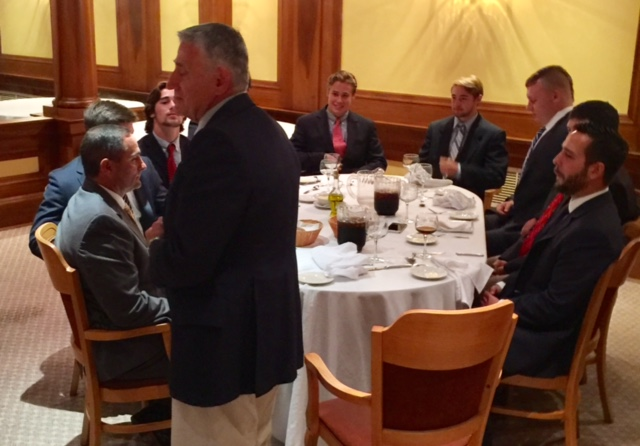 Pictured below; Rye Head Coach Dino Garr introducing the Rye Team Captains at the annual Sportsmanship Luncheon held prior to the October 1, 2017 game between Rye and Harrison. 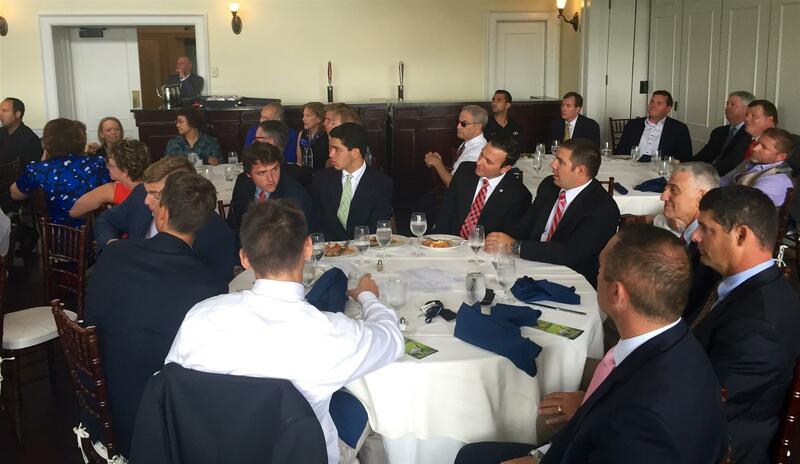 The luncheon has been a continued annual tradition hosted by the Rye and Harrison Rotary clubs since the 1930's. Rye won the game 35 to 7. Pictured below (left to right): Rotarian Jon Gluck, Past District Governor Lora Hugelmeyer, Rotarian Terry McCartney, Rye Rotary President-Elect Angela Sculti, Rotary Assistant/Area Governor Vincent Coakley, President of the Rye School District Board of Education Katy Keohane Glassberg, Rye High School Principal Patty Taylor, Rye City School's Superintendent Ed Byrne, Rye Rotary President Bob Manheimer. Sara Goddard, Chair of the Rye Sustainability Committee, addressed our meeting bringing our members up-to-date on the activities of her committee. 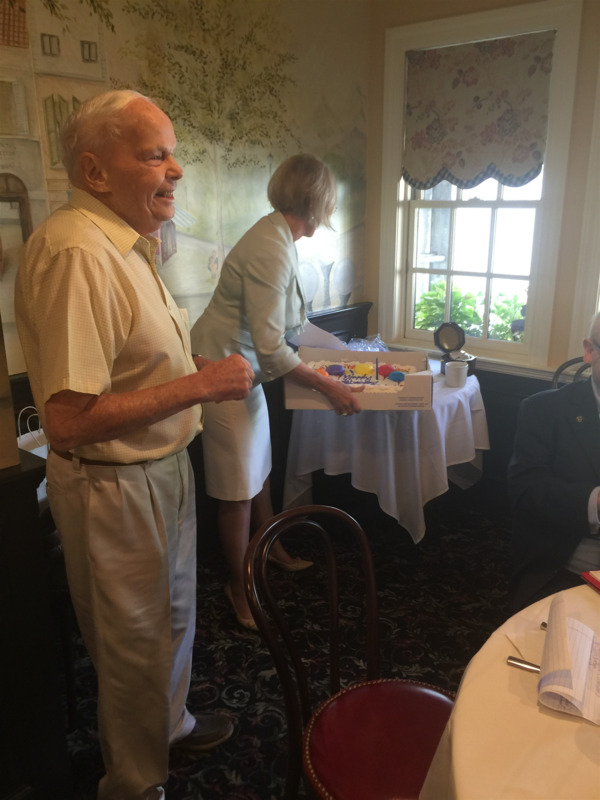 Happy 92nd Birthday to valued Rotarian Jim Jackson! 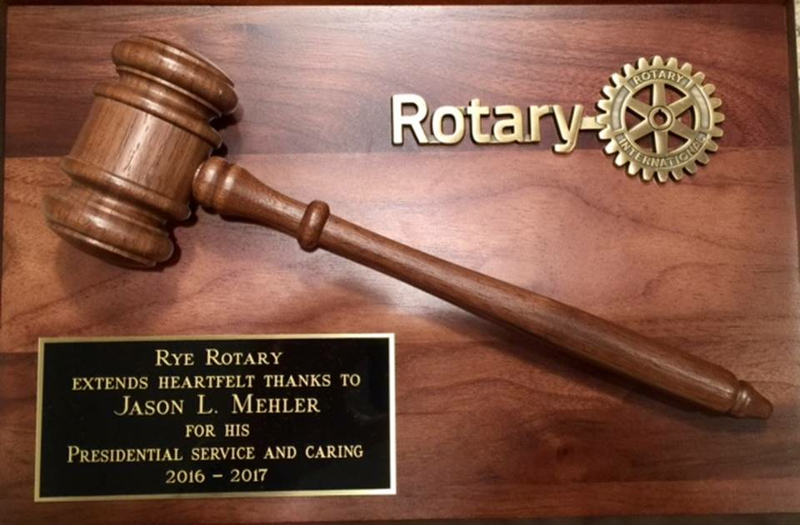 "Every Rye Rotarian in our club should feel pride in the things we have accomplished together." 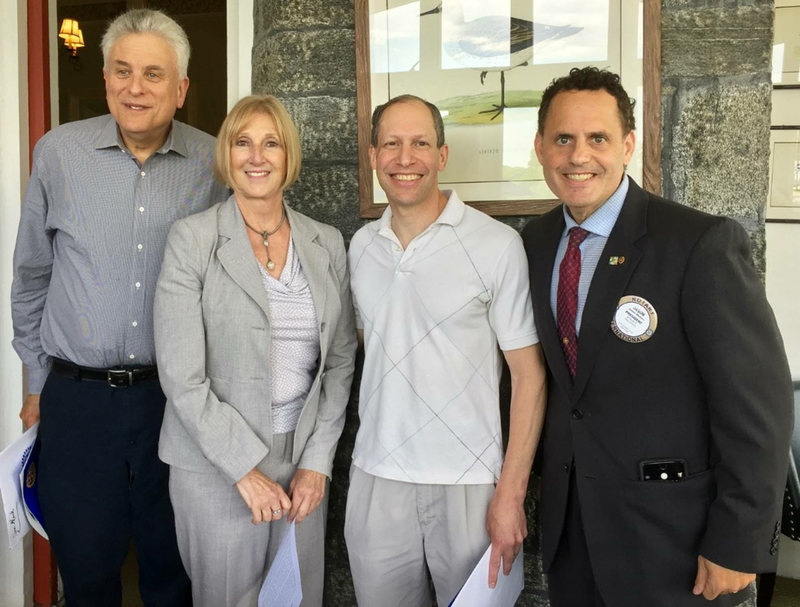 At the June 2 Luncheon at Whitby Castle Jon Gluck and Joel Salomon became our newest members. 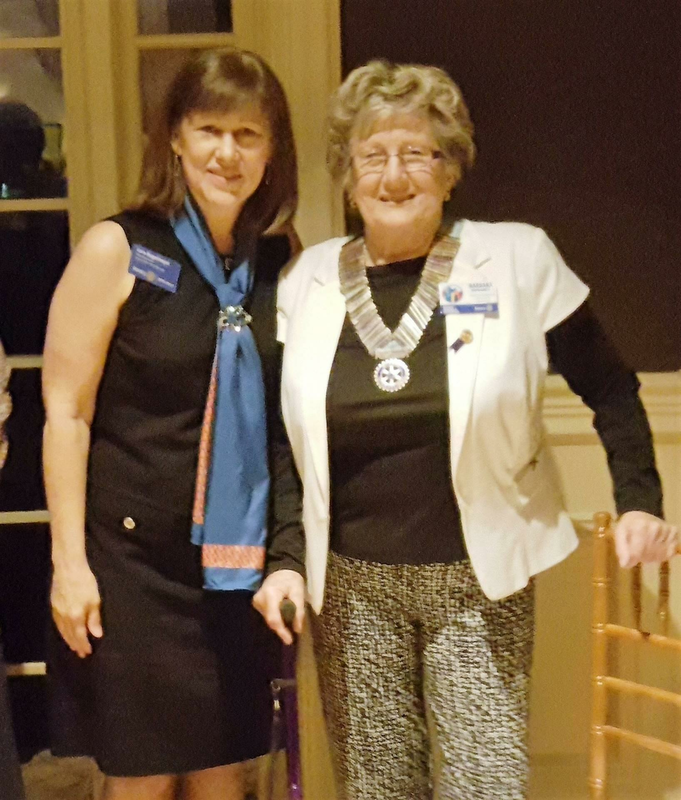 Congratulations and welcome to our new DG for 2017-18 Barbara Harris Edwards and a big Thank You to our outgoing DG and Rye Rotarian Lora Hugelmeyer. 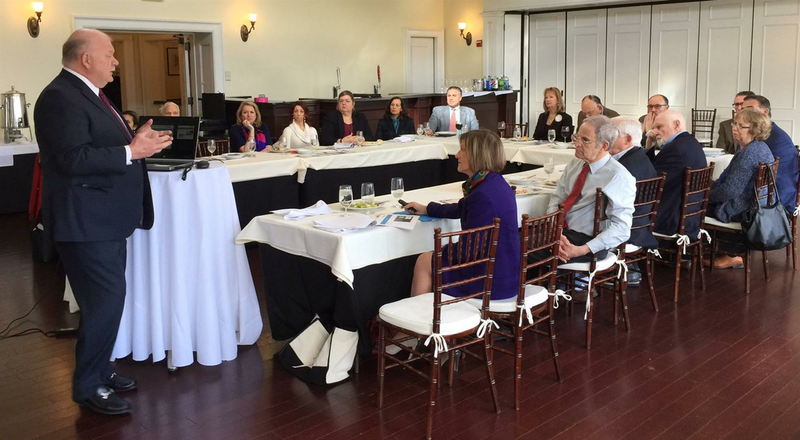 Our guest speaker at our May 11, 2017 breakfast meeting was Candy Abdoo, RN from Calvary Hospital. 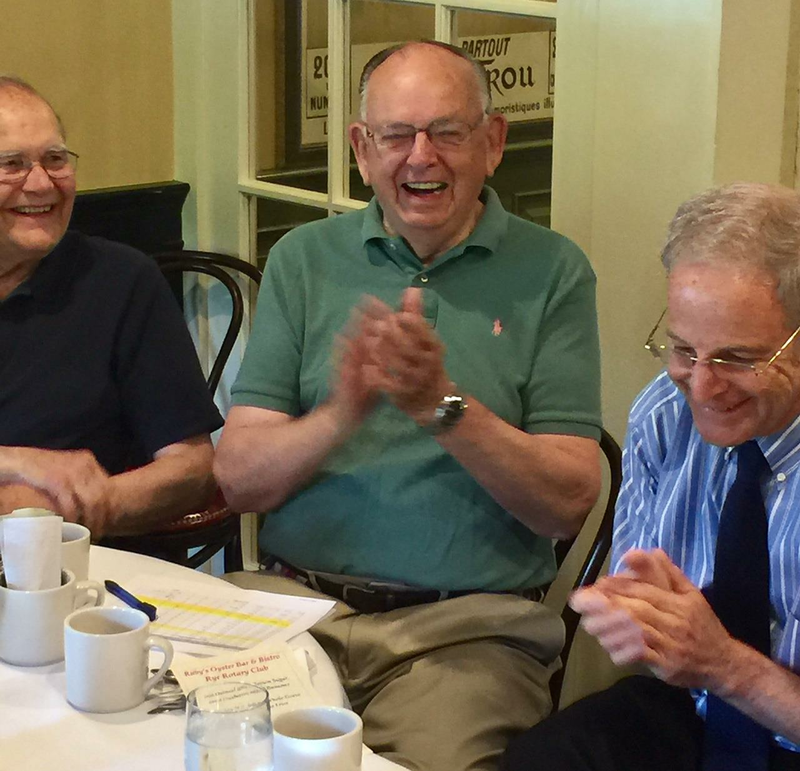 At our lunch meeting on May 5, 2017 Rotarian Dr. Robert Praid spoke about the process of dental implants. 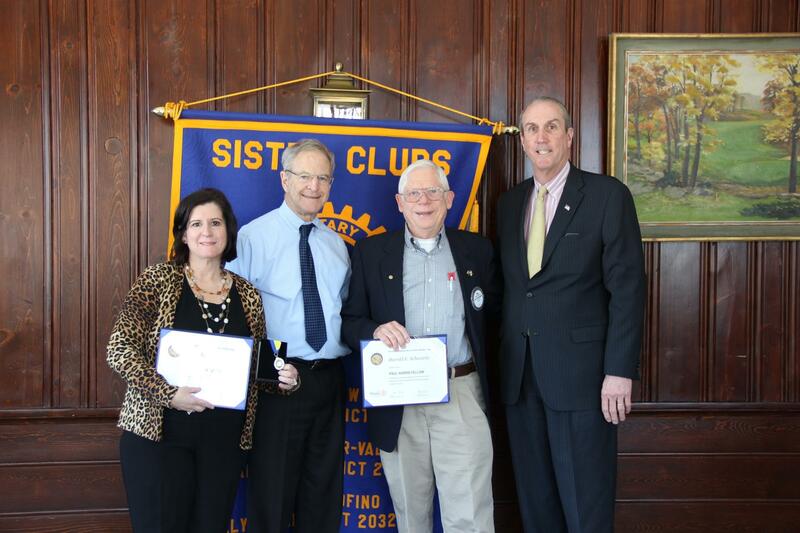 We also honored Rotarian Tom Saunders who soon will be relocating from Rye to Connecticut. 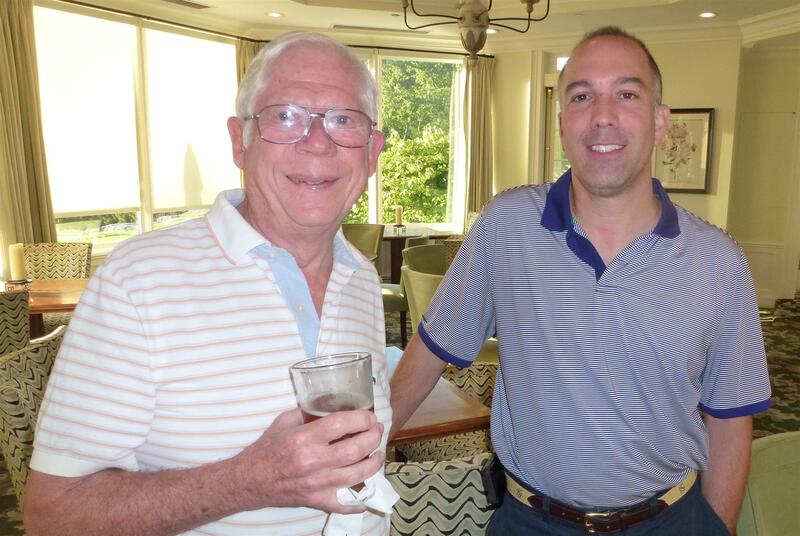 Tom has been a great asset to Rye Rotary serving in many capacities including President of the club. We wish all the best to Tom and Emily on their move. 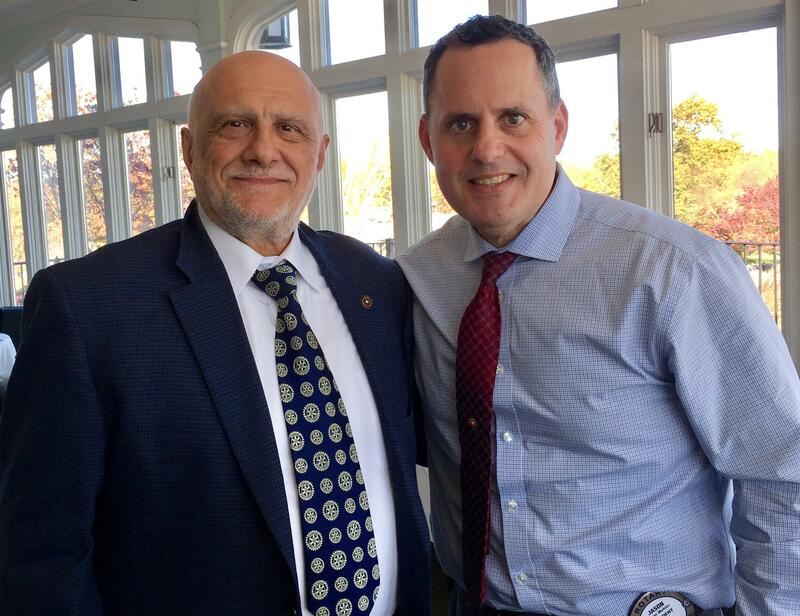 Our guest speaker at today's Rye Rotary Club meeting was George Grossman, Esq. 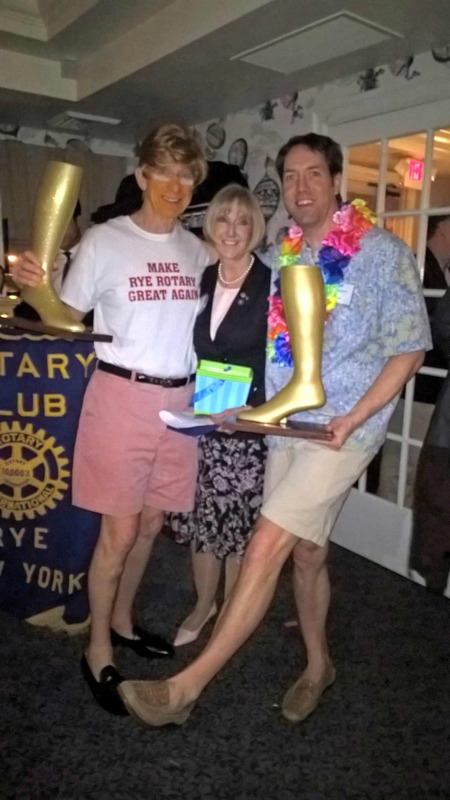 Thank you so much to all of the Rye Rotary Club members for making our Crazy Legs 2017 fundraiser event last evening a complete success. 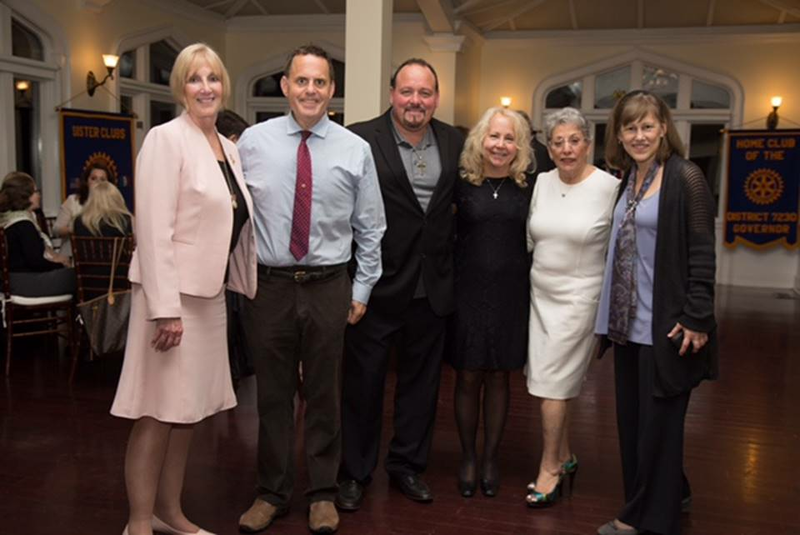 Special thanks to Pam Dwyer and Angela Sculti (co-chairs), Jason Mehler, Bob Manheimer, Melanie Ciraco, Ed Herbster, Rich Martinelli (committee members) and the Rye Rotary Foundation. 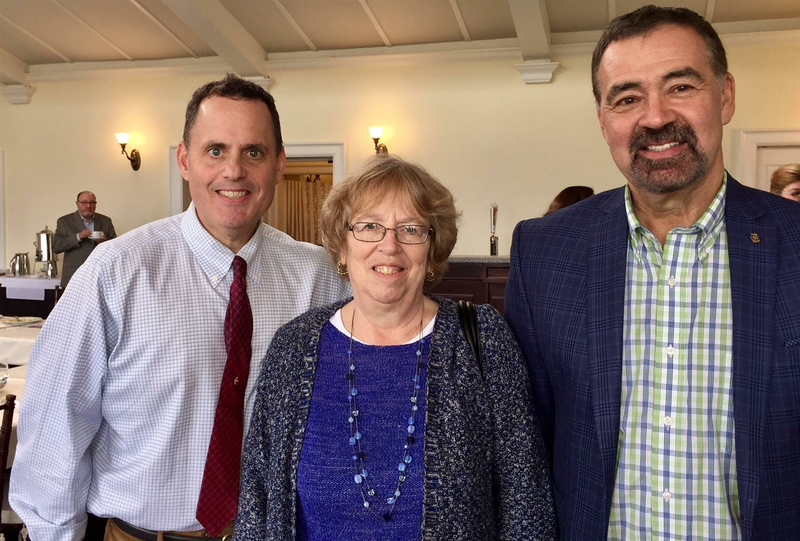 Our guest speaker at the April 7 luncheon was Joshua Hrabosky, a psychologist from Greenwich Hospital specializing in weight management and issues related to body image and self-esteem. Thank you to Kathy Carley-Spanier for arranging for Joshua to address the club. 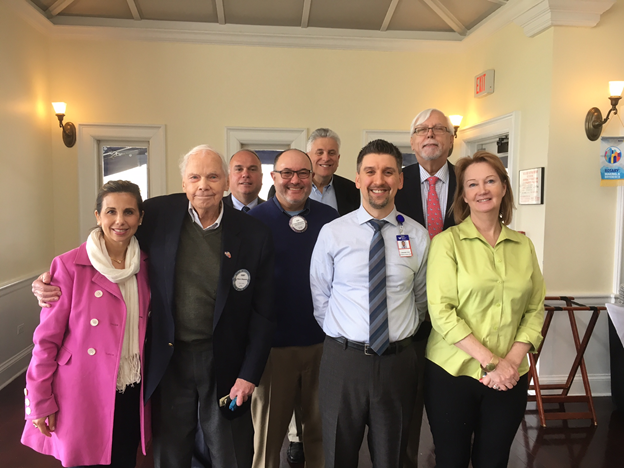 Pictured below (left to right); Rotarians Rita Tino, Coby Ellingwood, Richard Martinelli and Bob Manheimer, guest Jon Gluck, guest speaker Joshua Hrabosky, Rotarians Tom Saunders and Kathy Carley-Spanier. 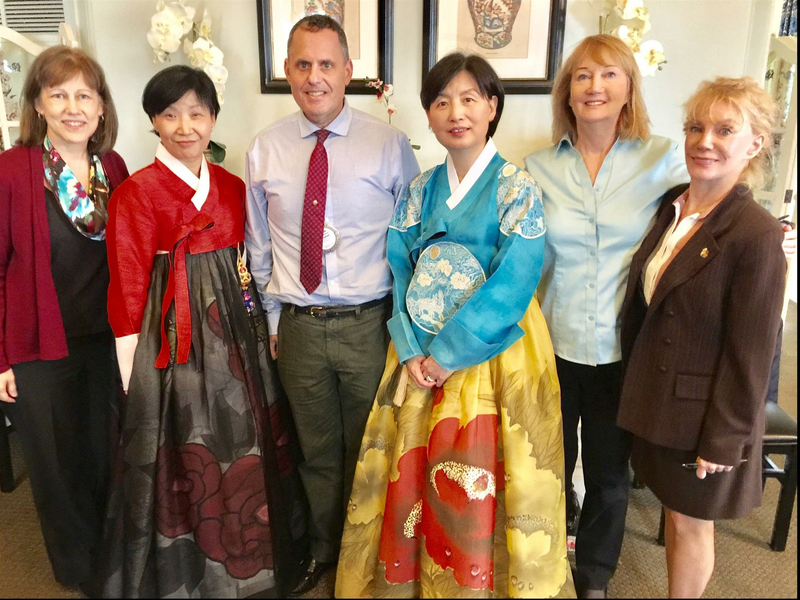 Our guest speakers at the March 31, 2017 meeting were from the Korean Spirit & Culture Promotion Project. 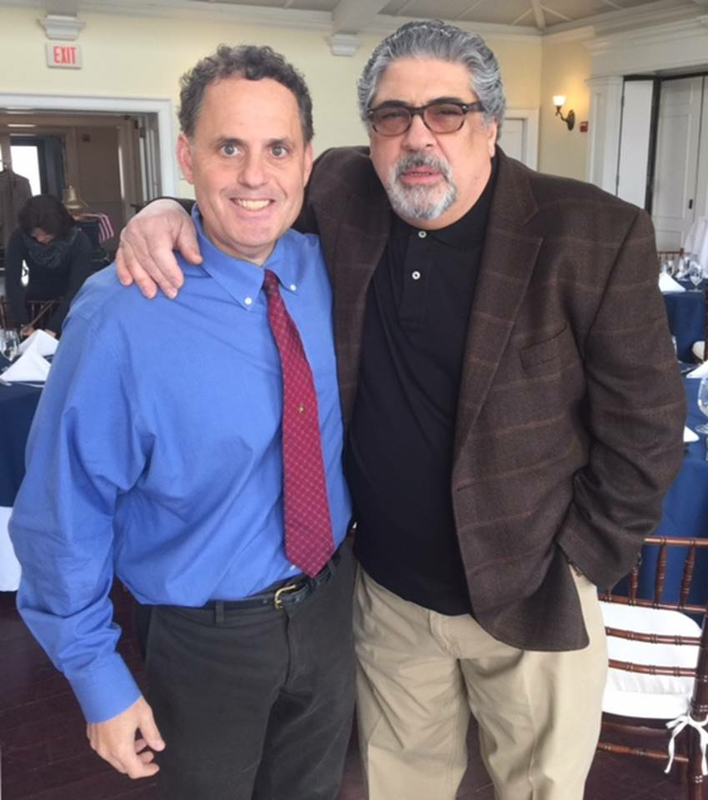 Actor Vincent Pastore from "The Sopranos" was our guest speaker today. 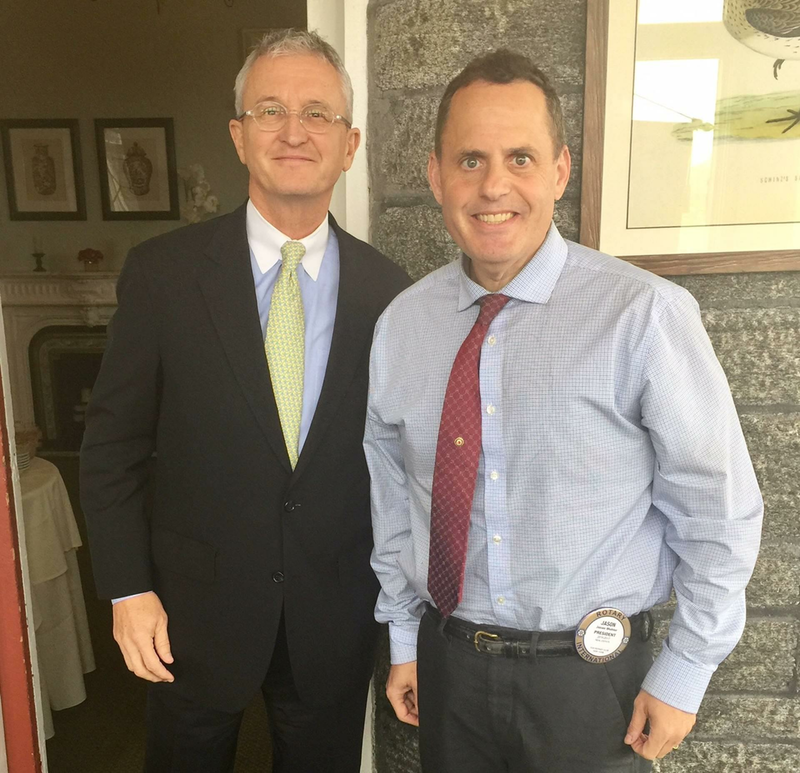 Scott Moore, the Director of Rye-Portchester-Rye Brook EMS spoke at our lunch meeting at Whitby Castle. 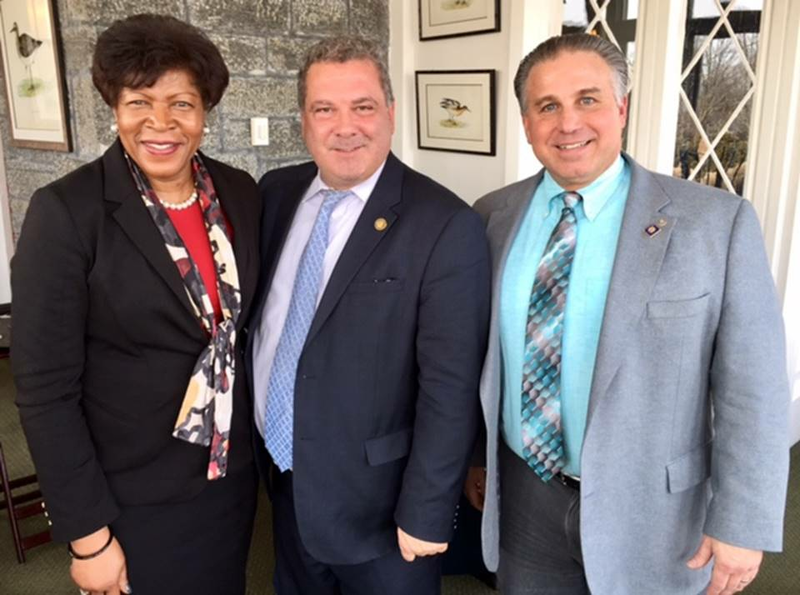 At our lunch at Whitby Castle on Friday, February 3, 2017 our guest speaker was Yonkers Mayor Mike Spano who brought the club up-to-date on current developments in his city. 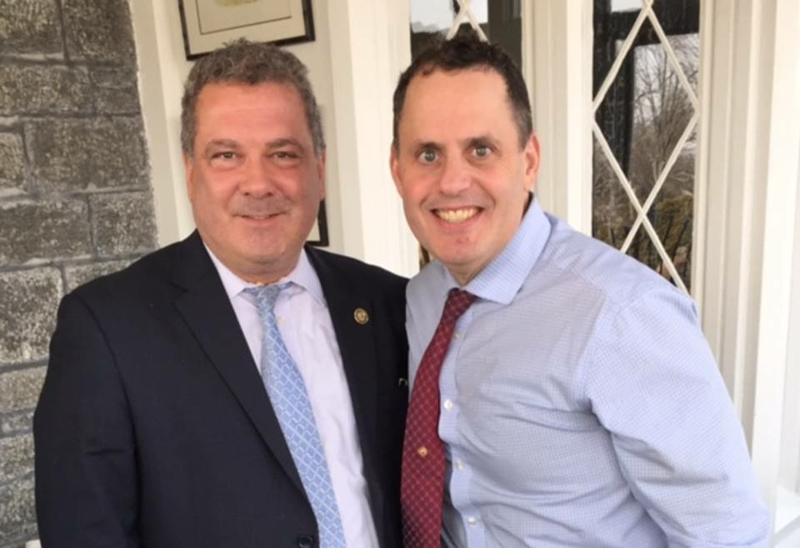 Pictured below: Mayor Mike Spano and Rye Rotary President Jason L. Mehler. 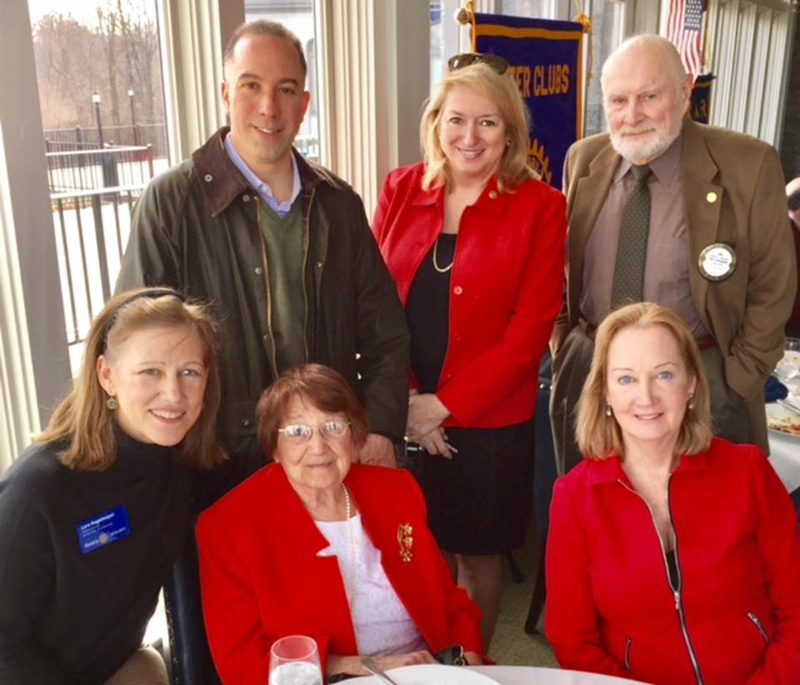 Pictured below: ( left to right) Rotarians Raul Bello, Jane Fox Ed Herbster, DG Lora Hugelmeyer, Angie Mancini and Rotarian Kathy Carley-Spanier. 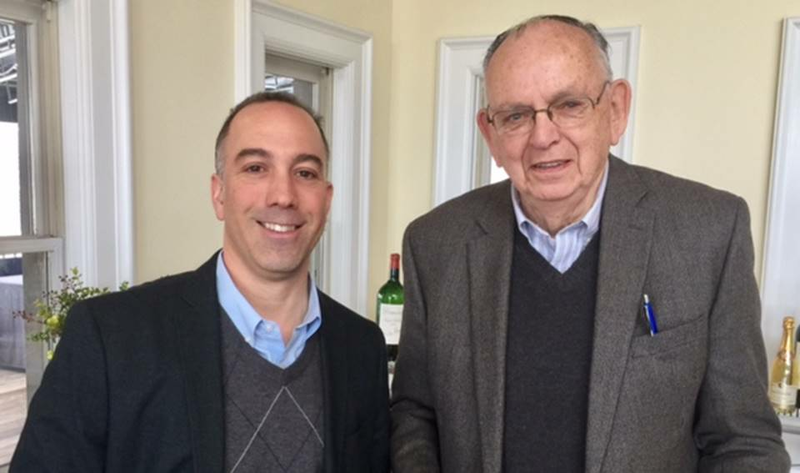 Greenwich Hospital President and CEO Norman Roth spoke at our club's January 27th lunch meeting. 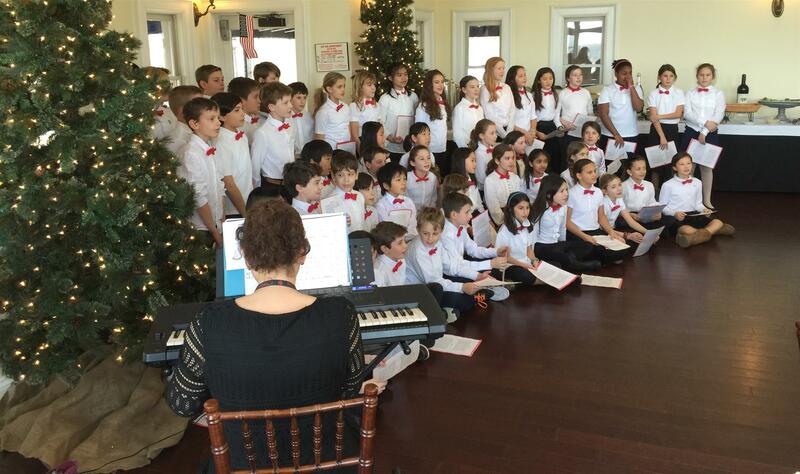 The annual Rotary Lions Holiday Luncheon at Whitby Castle on December 16, 2016 with a special performance by the Midland School Chorus. The Rye Rotary Club presented a $1,500 grant to the Rye Police Department this evening at the Whitby Castle in Rye, NY. The program is known as the “Adopt a School Program.” The program consists of school visitations during an officer’s tour of duty for the purpose of getting to know faculty, staff, students and parents. • To provide a visible police presence on school property. To encourage the mutually beneficial exchange of information and concerns between the officer and his/her adopted school and build positive relationships with faculty, staff, students and parents. • Reassure children about their safety and discuss methods they may use to avoid potentially hazardous situations. • Provide insight on the role of police officers and encourage students to consider law enforcement as a career. • Contribute to the positive development of the children. 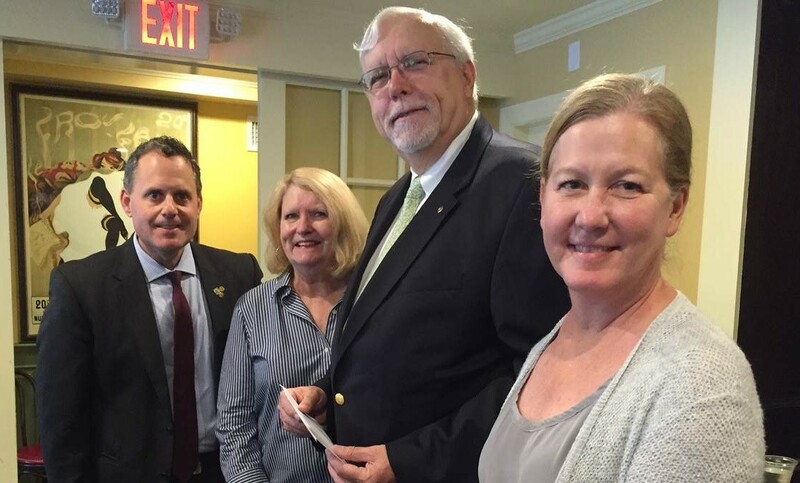 Below - Rotarian and Rye Police Department Commissioner Michael Corcoran accepts Rotary check. 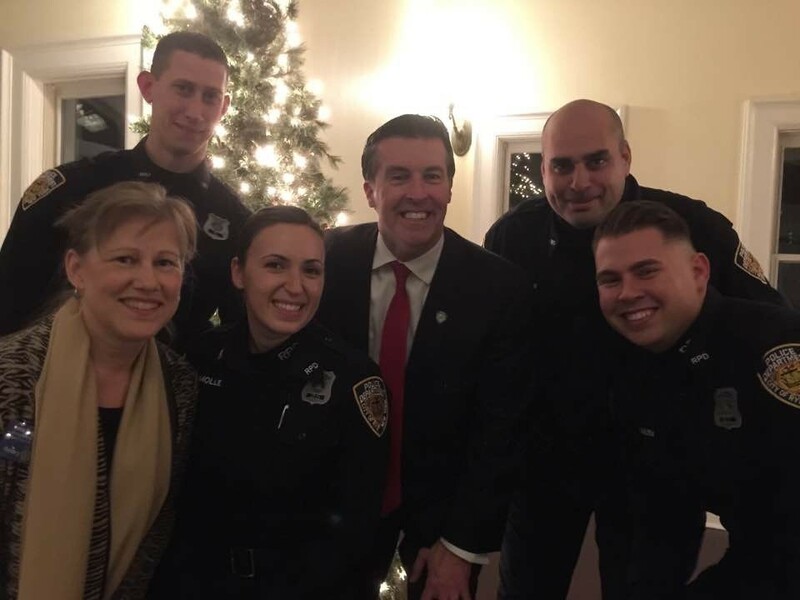 Below - District Governor and Rye Rotarian Lora Hugelmeyer with Rye Police Commissioner Michael Corcoran and Rye Police Officers. 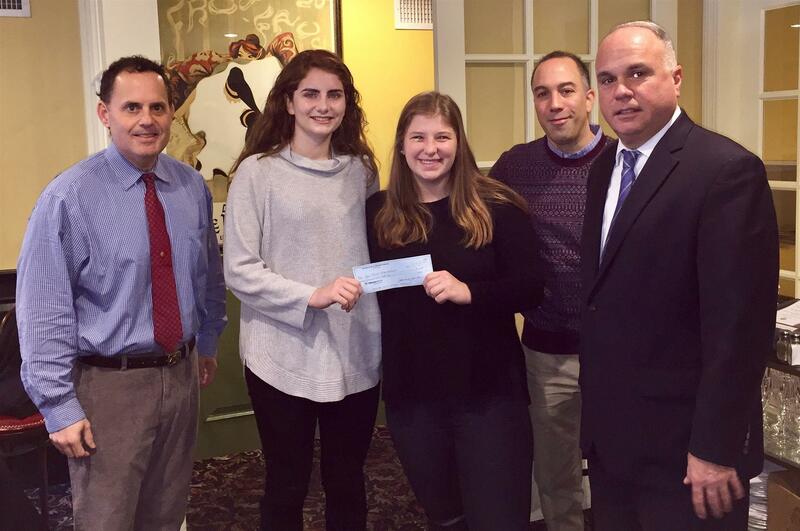 The Rye Rotary Club presented a grant to the Rye High School Girls Basketball Team this morning at Ruby's on Purchase St in Rye, NY. 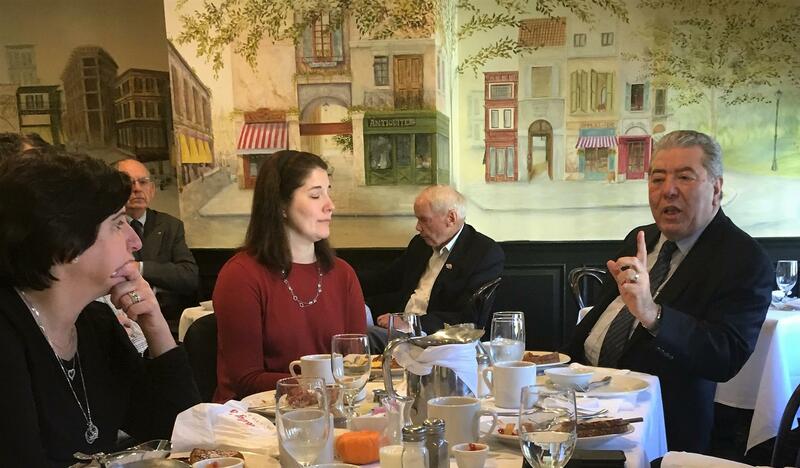 Eugene M. Guarino, Director of local Graham Funeral Home (pictured below speaking), accompanied by his daughter and Director, Anne Marie Getlik, addressed our breakfast meeting. 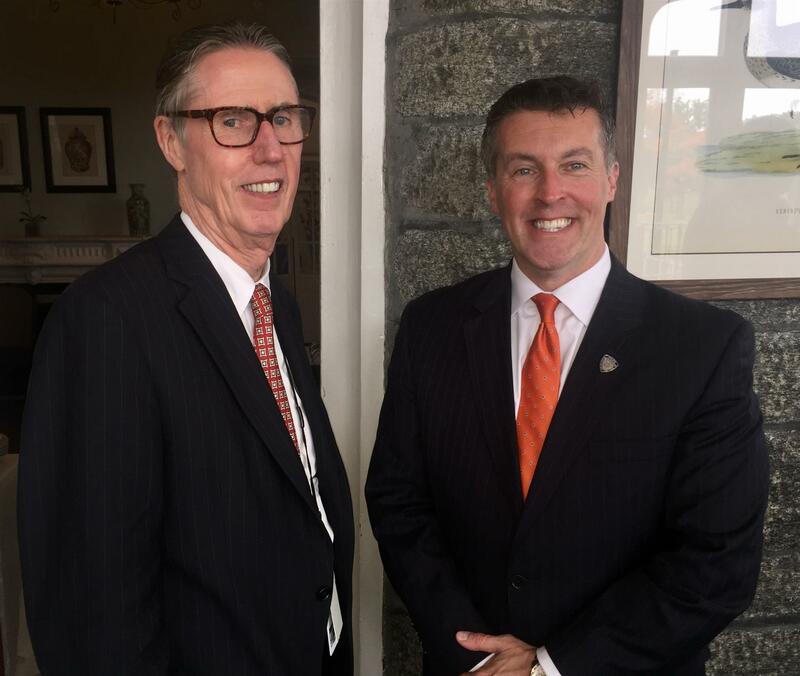 Interesting discussion including changes in New York laws impacting funeral homes operating in the state. 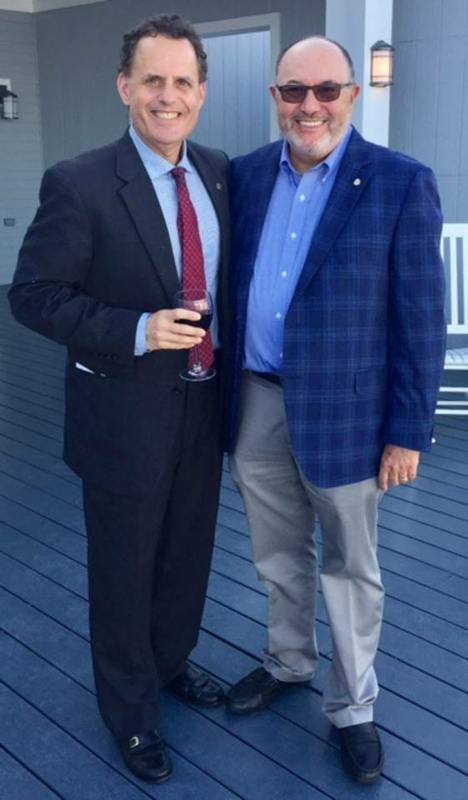 We were pleased to have former Rotary District Governor Joseph Dino, Jr. speak to our club. 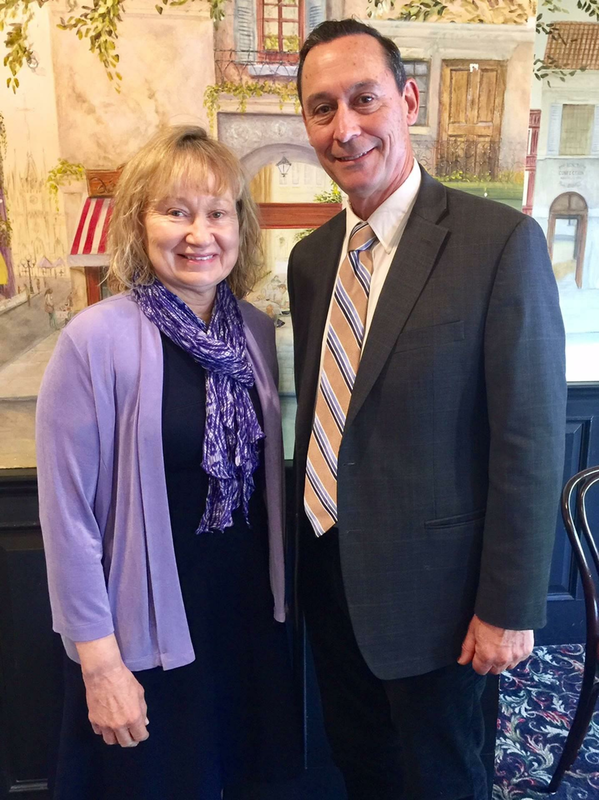 Our guest speaker for today's lunch - Patty Taylor, Principal of Rye High School. Good turnout for our luncheon meeting at Whitby Castle. 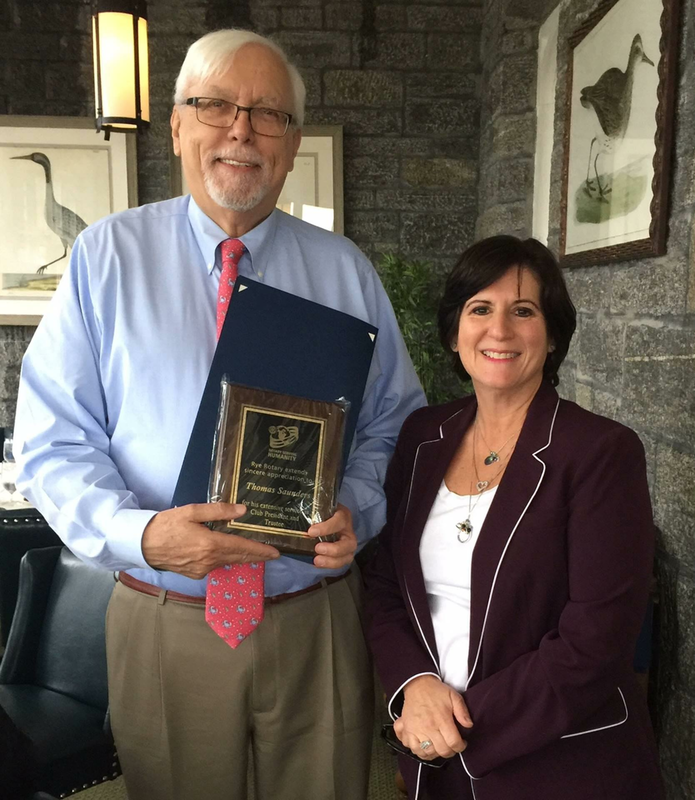 Rotarian Brian Monahan, Rye City Schools Superintendent was inducted into our chapter. Speakers included Rye City Councilwoman Kirstin Bucci and Councilman Richard Mecca. Amir Asadi, President of the Bronx Rotary Club, also spoke. 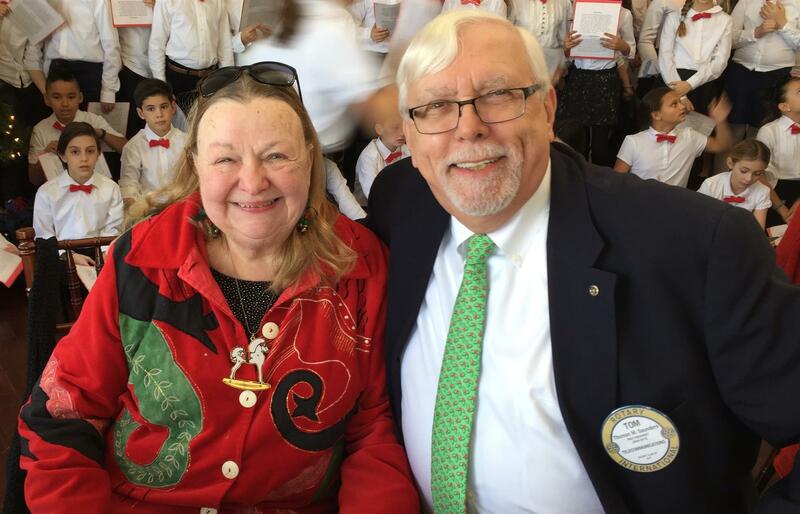 Pictured below Rotarians Brian Monahan and Pam Dwyer. 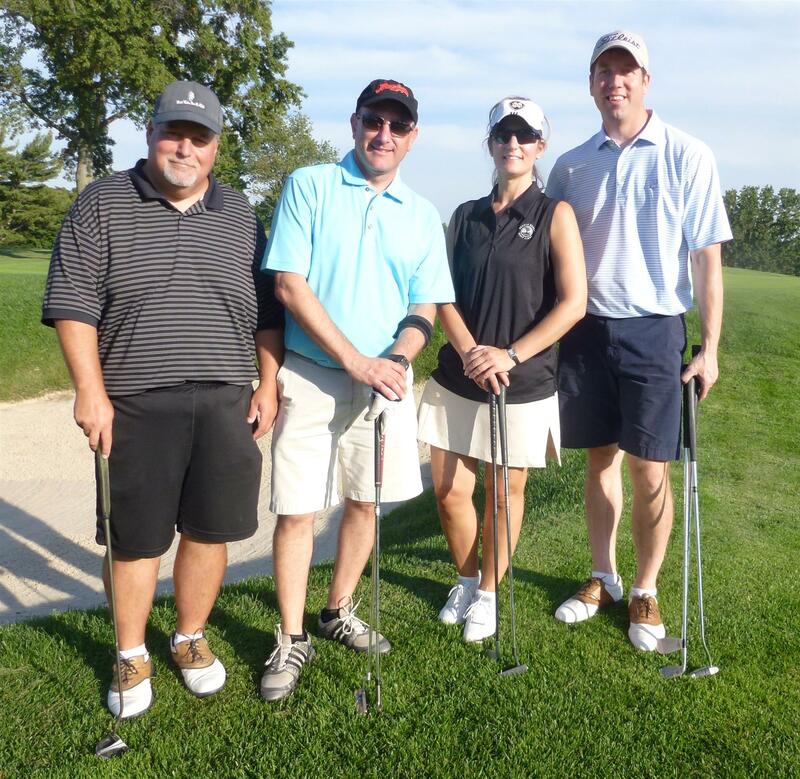 Our Golf Outing was a great success! Thanks to everybody who participated and sponsored! 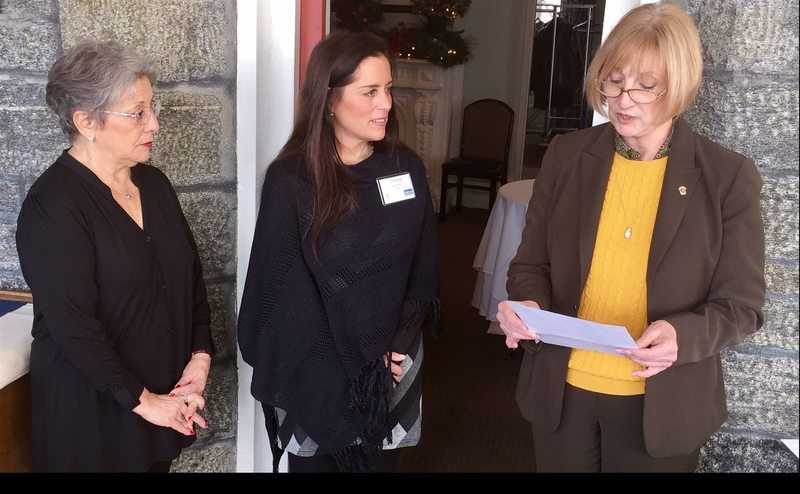 New Member - Today we inducted Rye City Councilwoman Danielle Tagger-Epstein into the Rye Rotary Club. 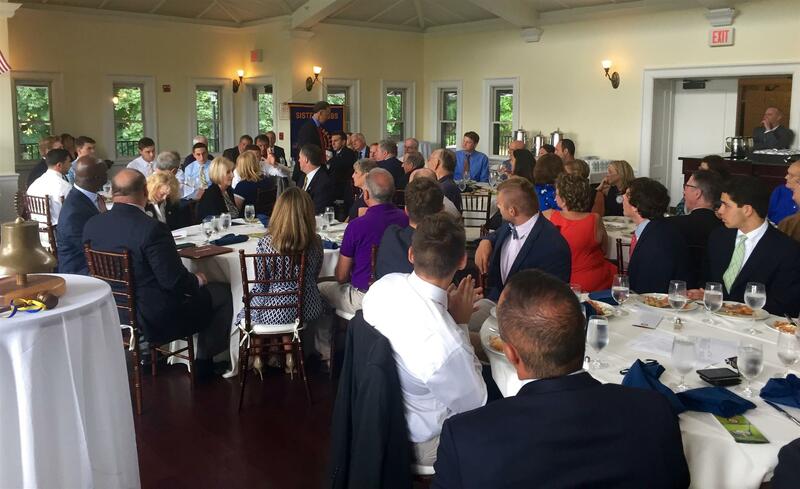 An annual tradition, The Rye Harrison Sportsmanship Luncheon, was hosted this year by Rye Rotary at Whitby Castle. Many thanks to all that participated. 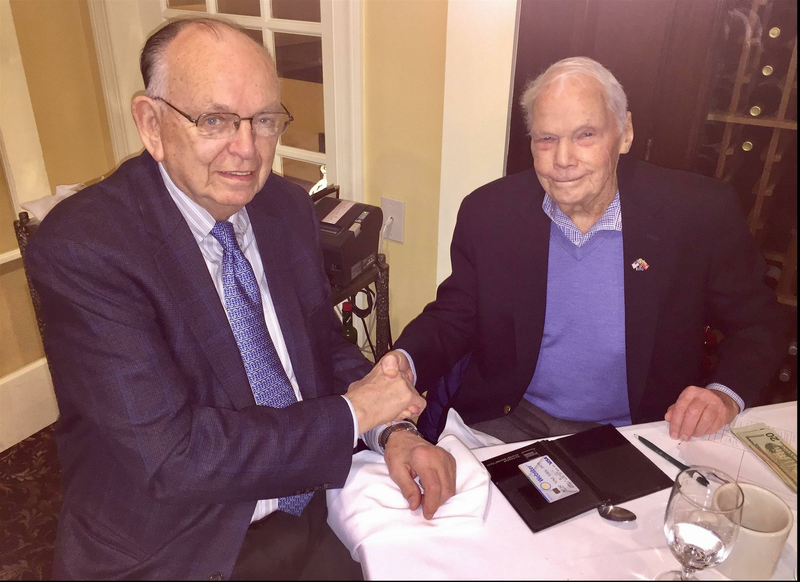 A special thank you to speakers Patrick Morrison and Harold Crocker. 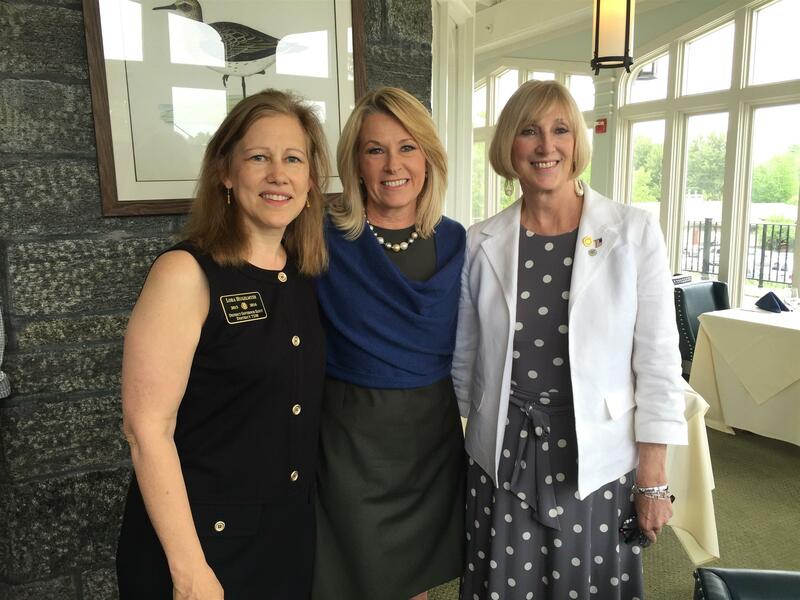 Diana Williams news anchor at WABC television and a resident of Rye was the guest speaker at our June 3, 2016 luncheon. 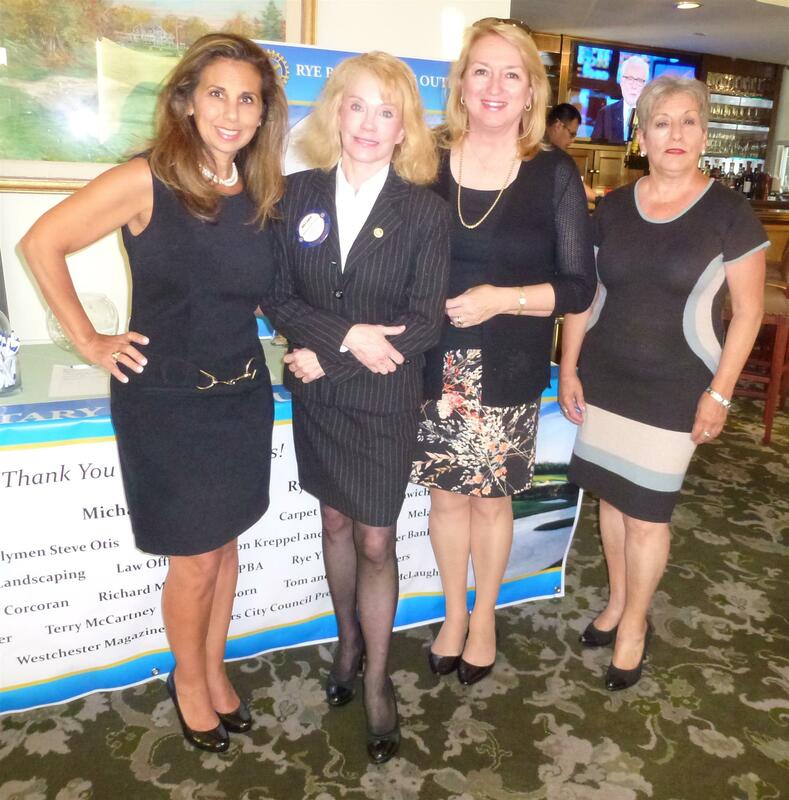 Pictured from left are Lora Hugelmeyer, Rye Rotarian and District Governor-Elect, Diana Williams, and Pam Dwyer, Rye Rotary President. 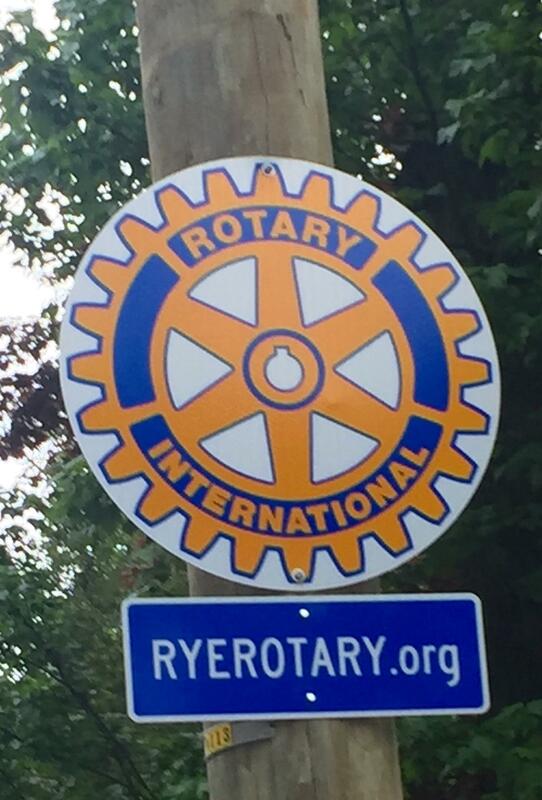 The Rotary sign has been AWOL for a while. Now its back! 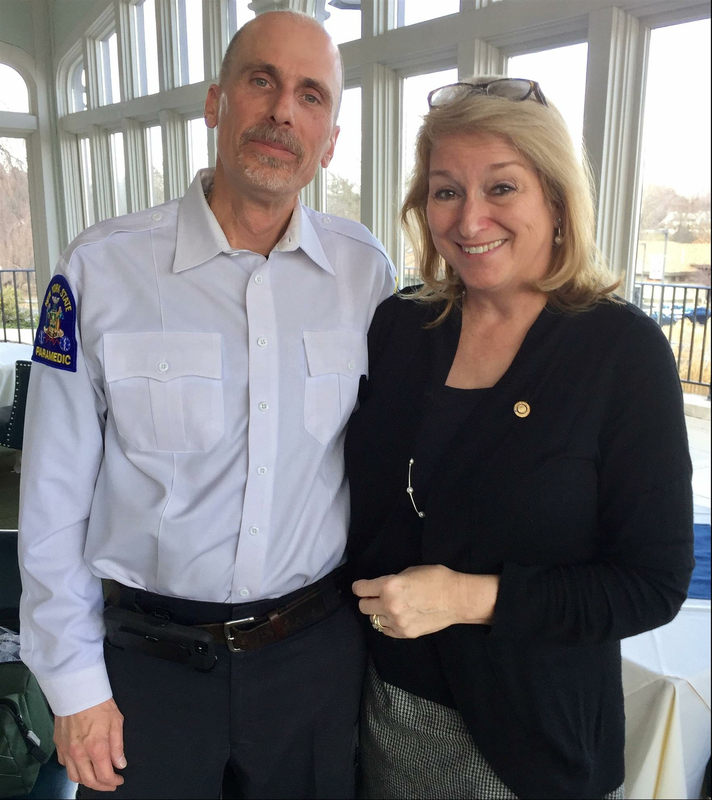 Rye Rotary inducted two new members - Anne Edwards, Principal of Rye Middle School and Michael C. Corcoran, Jr., Police Commissioner - City of Rye Police Department. 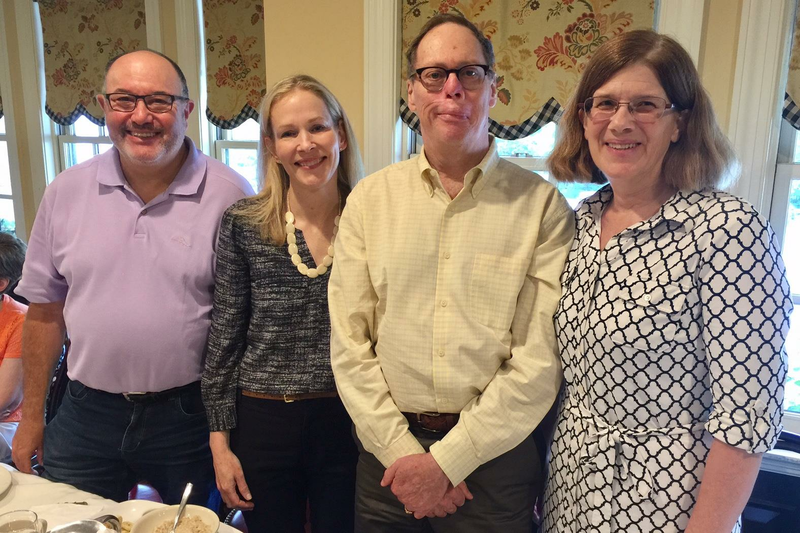 Pictured from the left are President-Elect Jason Mehler, Michael Corcoran, Anne Edwards, Tom Saunders, and President Pam Dwyer. 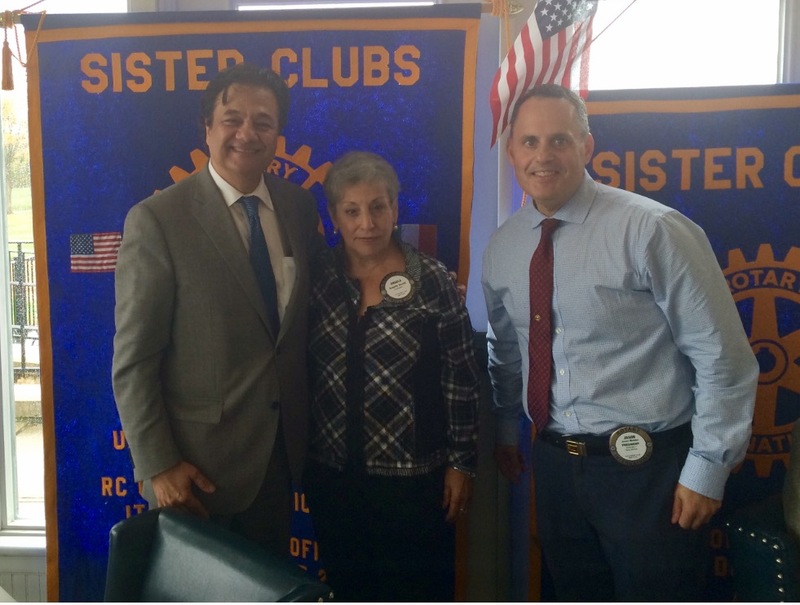 Rye Rotary inducted two new members at today's meeting - Rita Tino and Raul Bello. 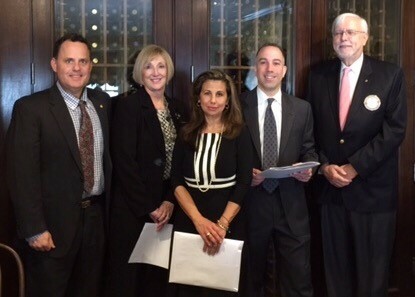 Pictured from left are Jason L. Mehler, Pam Dwyer, Rita Tino, Raul Bello and Tom Saunders. 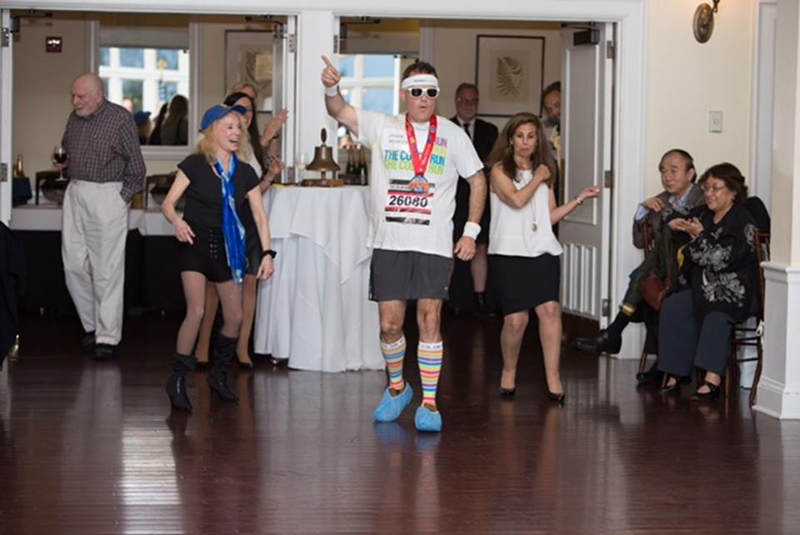 Crazy Legs 2016 a Huge Success! 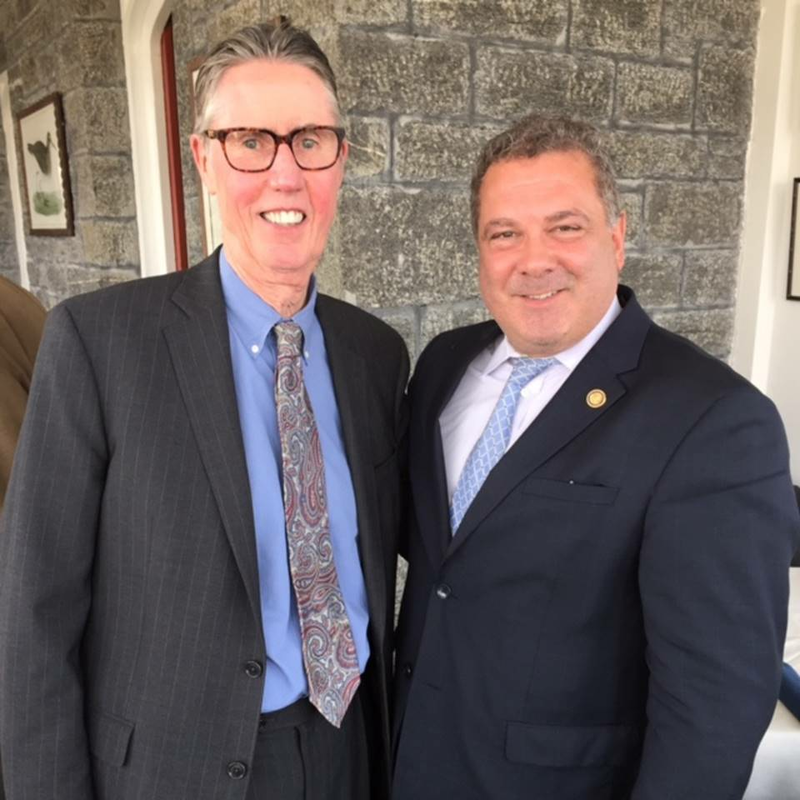 Matt Anderson - CEO, The Osborn, Jay Archer, David Cutner, Esq., Bill Fishman, Esq., White Plains Rotary President, Robert GiaQuinto - Rye Beach Pharmacy, Robert Glennon - Rye Postmaster, George Latimer - State Senator, Robert Manheimer, Terence McCartney, Esq - Rye City Councilman, Anthony Piscionere, Esq, Robert Praid, DDS, Thomas Saunders,and Coby Ellingwood. 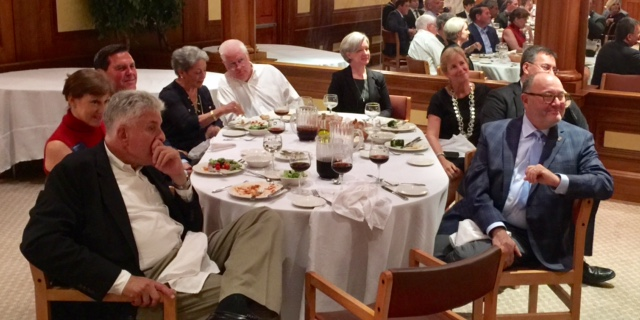 Over 80 guests attended the fundraising event. 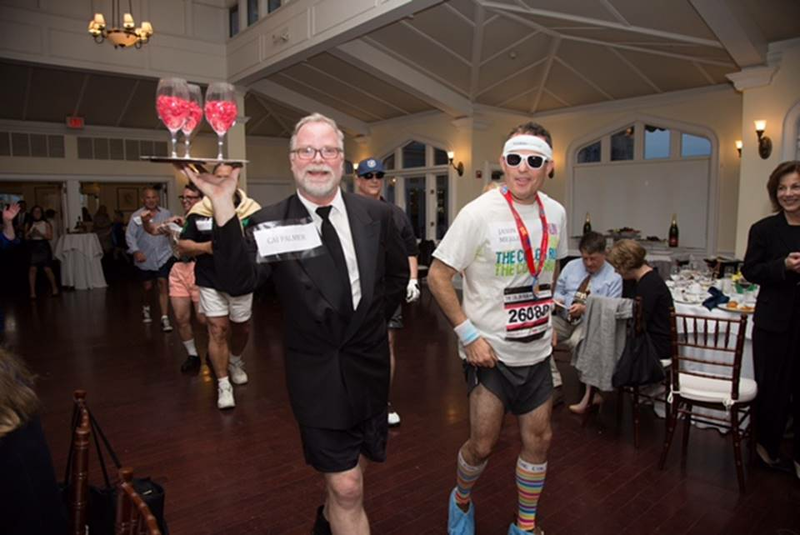 David Cutner won first prize for best outfit and Matt Anderson won for best legs. They will certainly be invited back next year to defend their trophy! 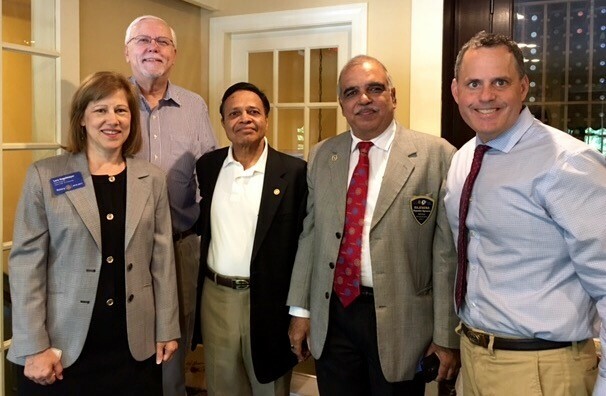 Rye Rotary welcomed Swapna Venugopal, a reported for Lohud as weekly guest speaker. 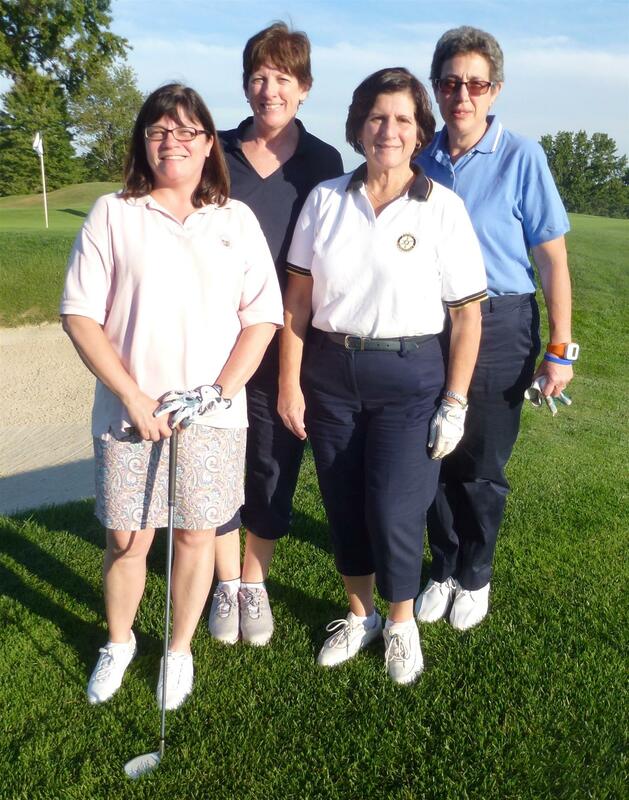 From left to right, Lora Hugelmeyer, District Governor Elect, Swapna Venugopal, Pam Dwyer, Club President. 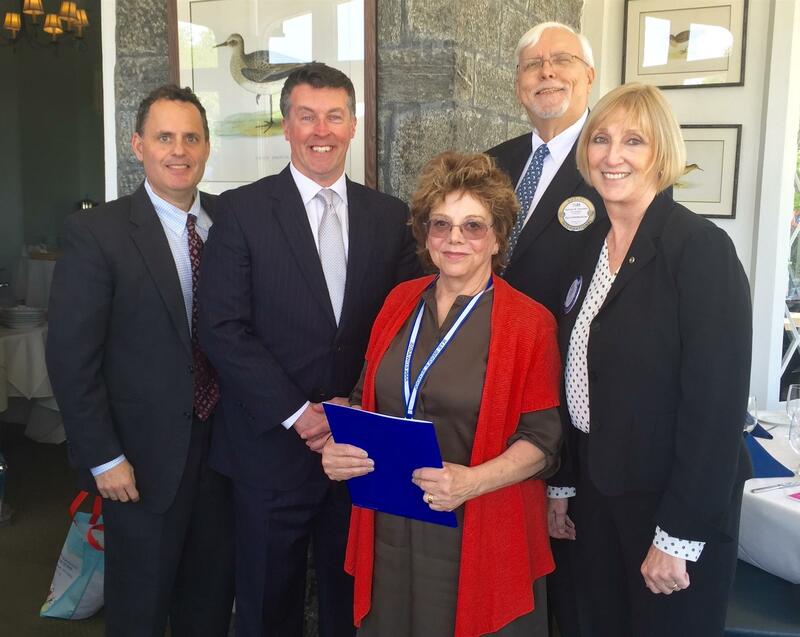 The Rye Rotary and Rye Lions Club held their annual Holiday Luncheon at the Apawamis Club in Rye on December 17, 2015. 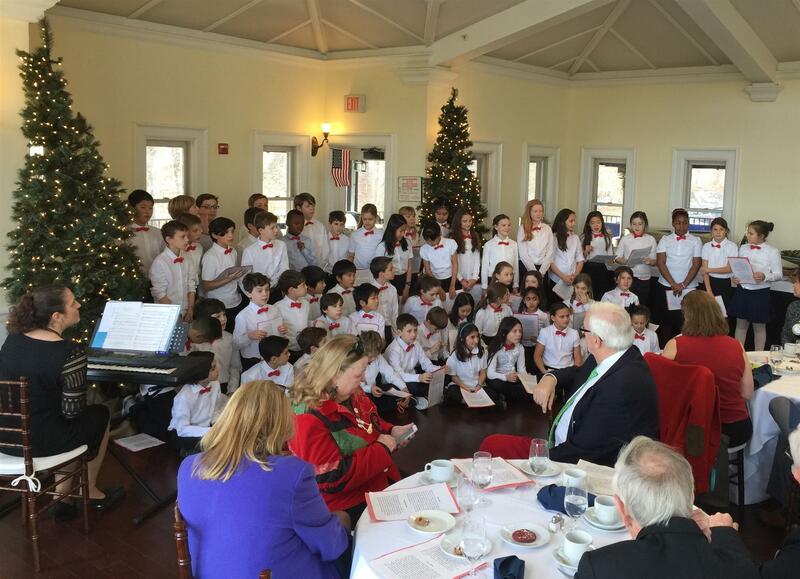 The choir from the Midland School sang holiday songs to highlight the afternoon. 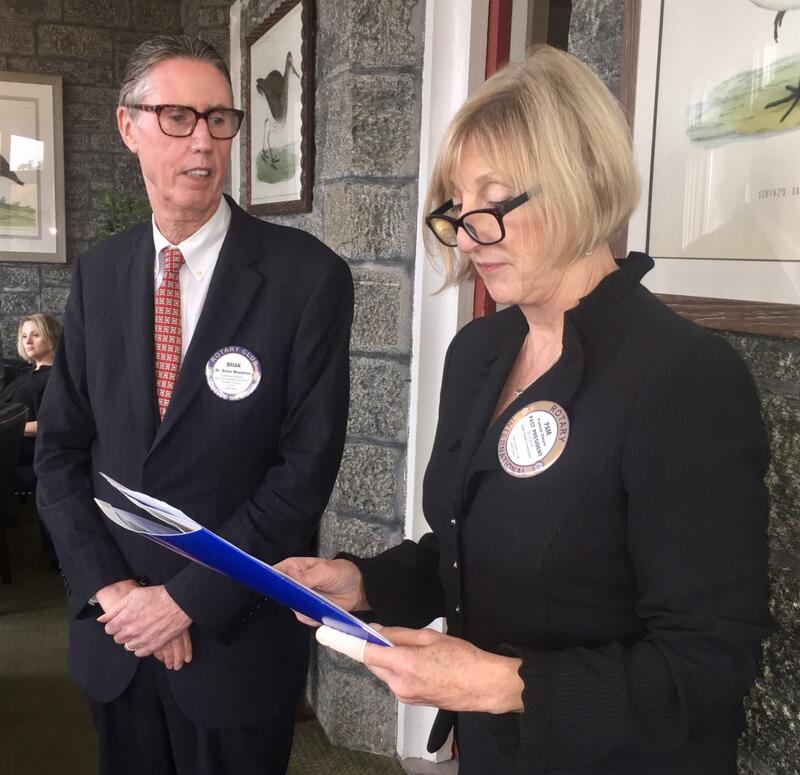 Rye Rotary Club inducts new members Angela Sculti and Terry McCartney. Welcome! Come join the fun at the upcoming Rotary Fellowship Meeting at Tikki Bar at Playland on August 24, 2015 at 6:00pm. Free Parking. $28.00 includes drink and nibbles. RSVP to President Pam Dwyer at PDwyer@websterbank.com. Hope to see you there! 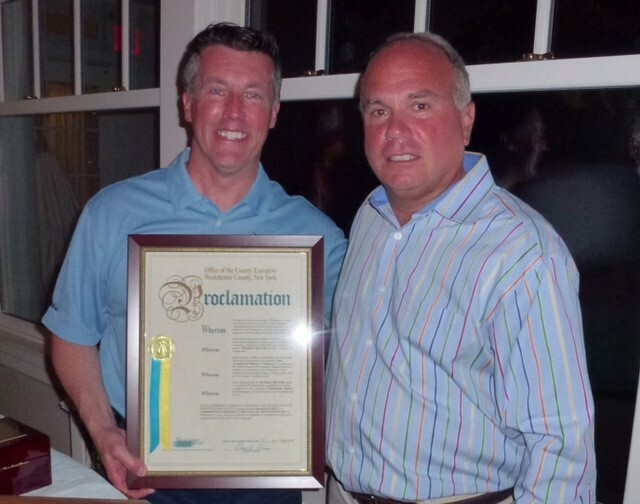 Rye Rotary Treasurer James Jackson Celebrates a Milestone! 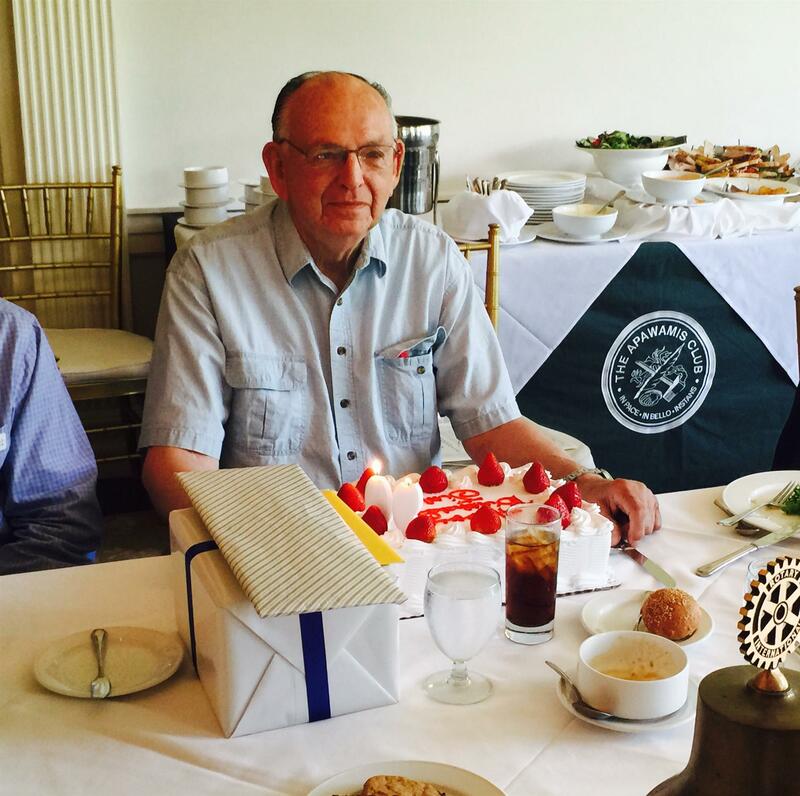 The Rye Rotary Club wishes a Happy 90th Birthday to our beloved Treasurer Jim Jackson! Treasurer Jim Jackson!! 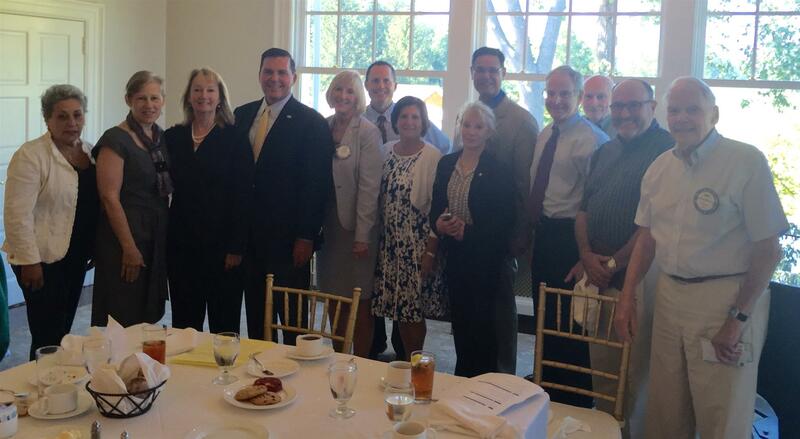 Rye Rotary Inducts New Officers and Directors for 2015-2016 at the Shenorock Shore Club on June 18, 2015. 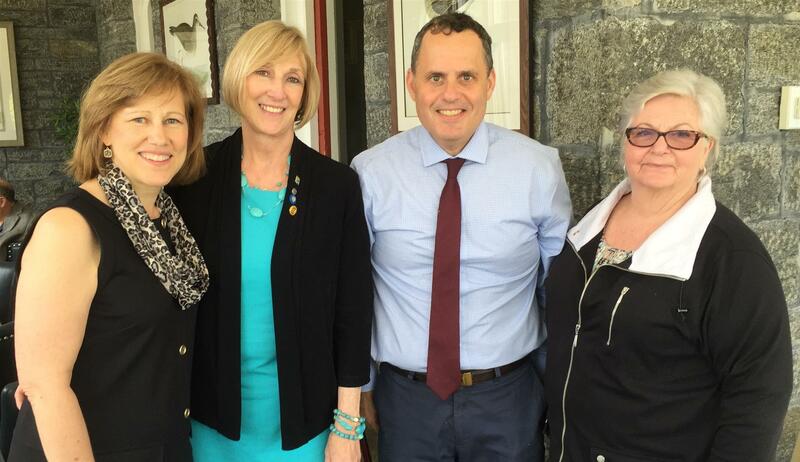 Congratulations and best wishes to incoming President Pamela Dwyer and many thanks to outgoing President Julie Kattan on a successful year! 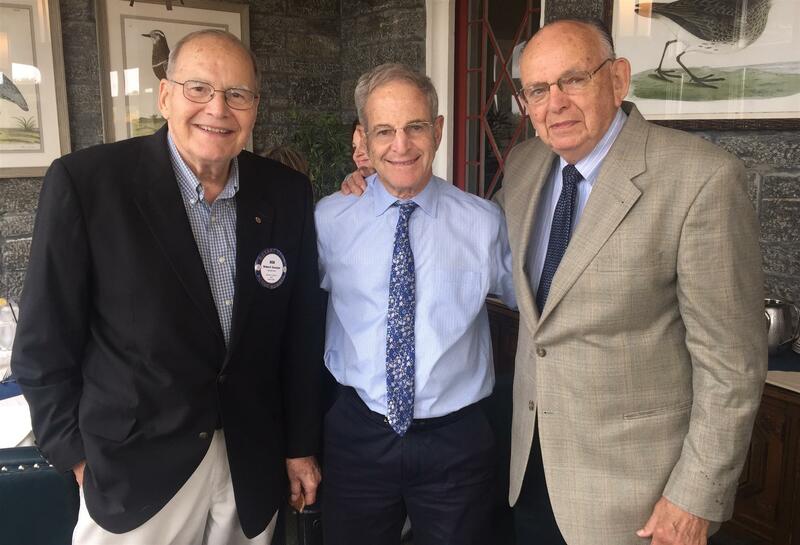 Rye Rotary Congratulates President Julie Kattan and Immediate Past President Hal Schwartz on their Paul Harris Fellow Awards. 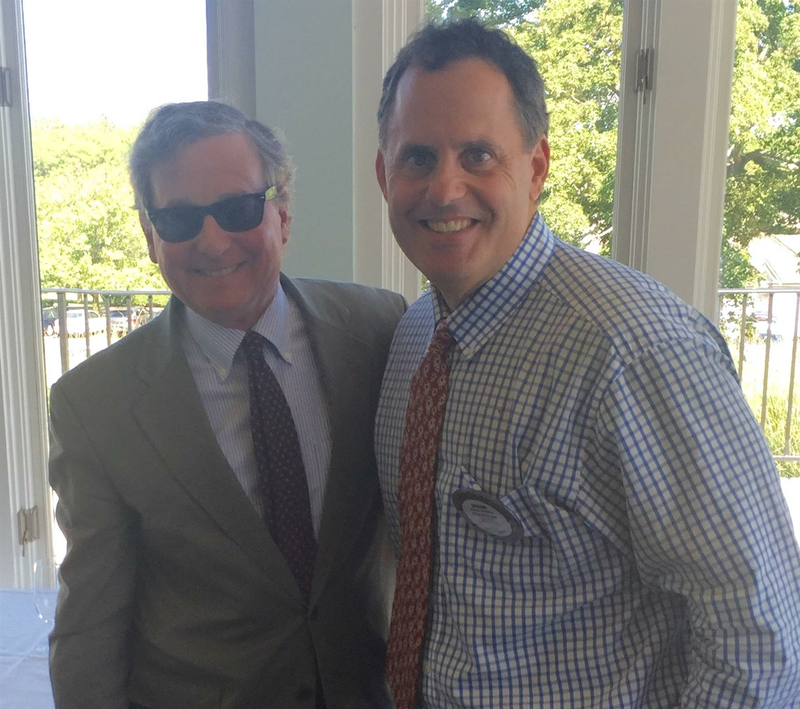 The Rye Rotary Club and the Harrison-Mamaroneck Rotary Club held their annual sportsmanship luncheon on September 12, 2014 at the Apawamis Club in Rye. 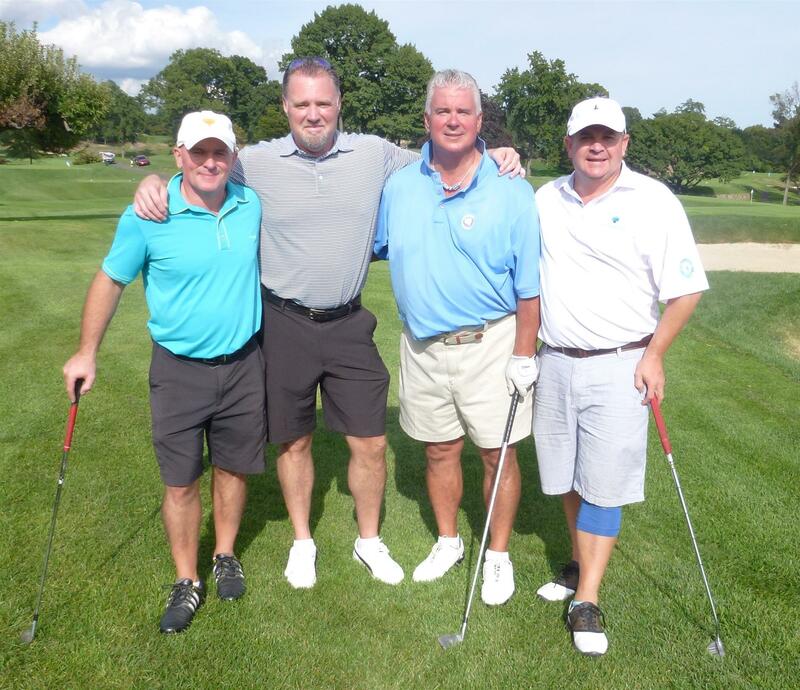 The guest speaker was former New York Giant Pro Bowl and Superbowl Champion, Sean Landeta, who spoke to the attendees, which included the Rye and Harrison Football Team Coaching Staff and Captains. Mr. Landeta's discussion regarding good sportsmanship both on and off the field was inspirational and well received by all in attendance. The Rye football team won the game the next day, by a score of 24-13, and we congratulate all of the players on their good sportsmanship and hard work! 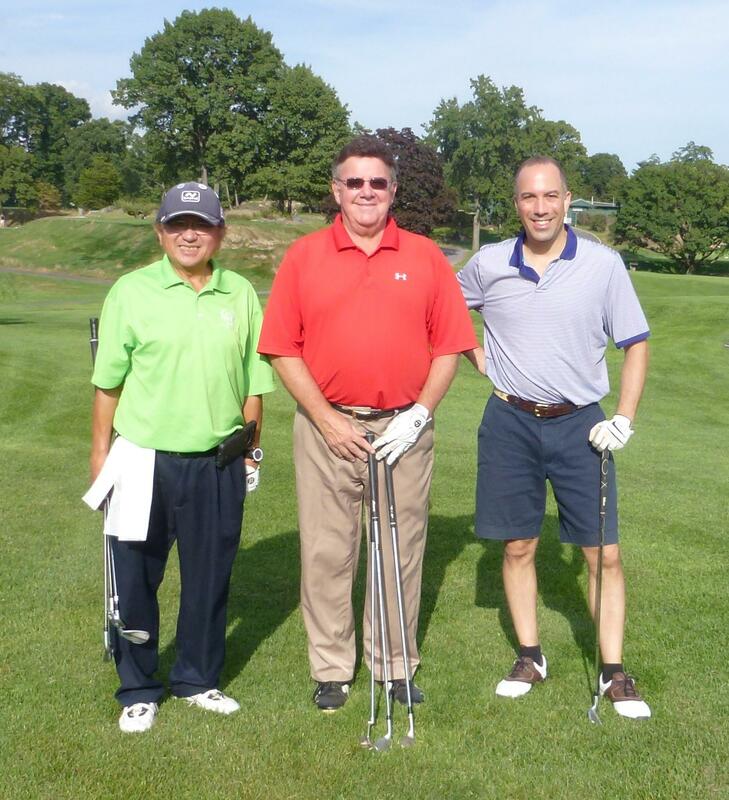 In the photo above, Rye Rotary President Julie Kattan and Harrison Mamaroneck Rotary President Anthony Andreana pose with Sean Landeta. 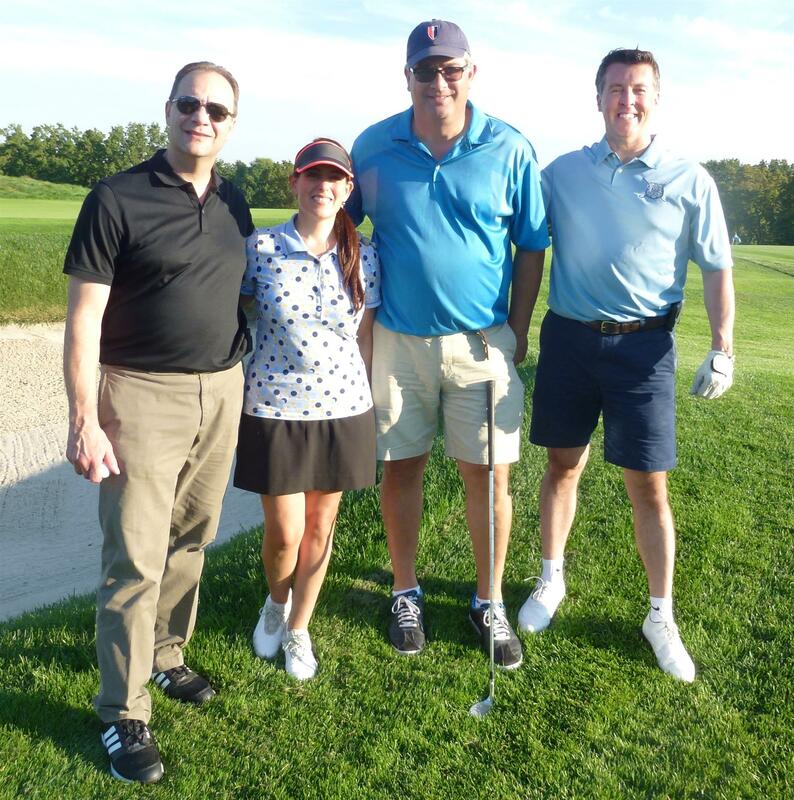 On Friday, May 2, 2014 the Rye Rotary Club held a fundraising event with our Italian Sister Clubs; the Courmayeur and Portofino Rotary Clubs to raise funds for a physician training program in Aosta in Northern Italy. Doctors from Burkina Faso in Africa, where there is another Rotary Club, will be flying to Aosta, Italy to learn new medical procedures and techniques that they can use when they return to Burkina Faso. Our fundraising dollars will be used to pay for the doctor training program in Aosta, Italy. The Rye Rotary Club teamed up with a resident African artist at Arts Westchester by the name of Joe "Kwaku" Cobbinah. Mr. Cobbinah is from Ghana and he featured art from different countries in Africa, all stunning and brilliant, ranging in price from several hundred dollars and up. The fundraiser was a big success and we thank Lora Hugelmeyer and Melanie Ciraco for their hard work in making this event worthwhile. 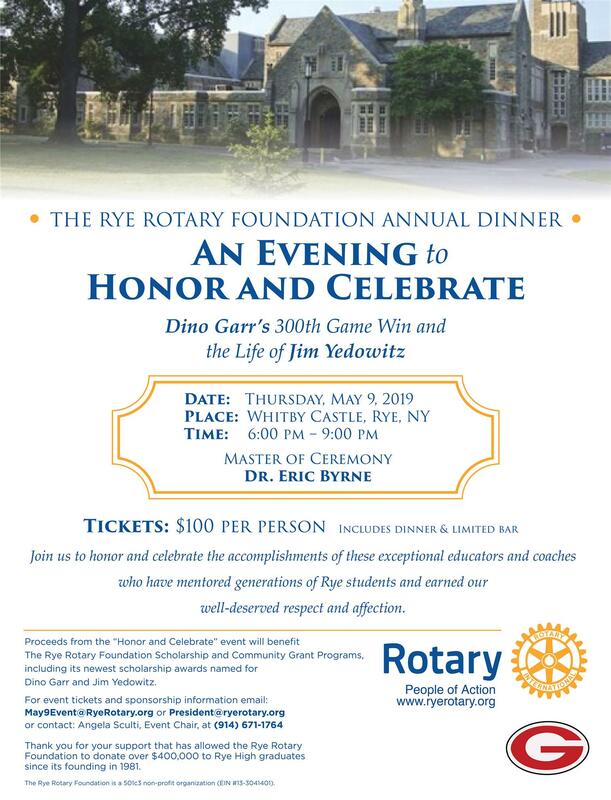 The Rye Rotary Club will hold its Annual Installation Dinner on Thursday, June 19, 2014 at 6:00pm at the Shenorock Shore Club in Rye, New York. Please save the date. Details to follow. Please see the Invitation in the Downloads Section of this web page. (Lower left hand corner). Quote for the Month - Who Said It? Once again the Rye and Harrison/Mamaroneck Rotary Clubs will co-sponsor a Wine Tasting at Emilio's Restaurant in Harrison, New York on September 19, 2013 at 5:30pm. Please see complete Wine Tasting Invitation under Download Tab on this website. We are now collecting Wine Tasting Event donations for inclusion in our gift baskets to be raffled off the evening of the event, and member contributions are greatly needed! 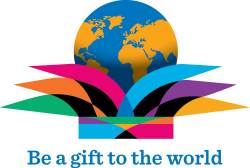 Please bring any of the following items to our Friday Rotary Club meetings: Gift Certificates, wine or liquor bottles, or plants (orchids). The themes of the baskets this year will be Patriotic, Spa, Beauty, Beach/BBQ, Thanksgiving and Autumn Beauty. Your cooperation in supporting this Club fundraising event is much appreciated! 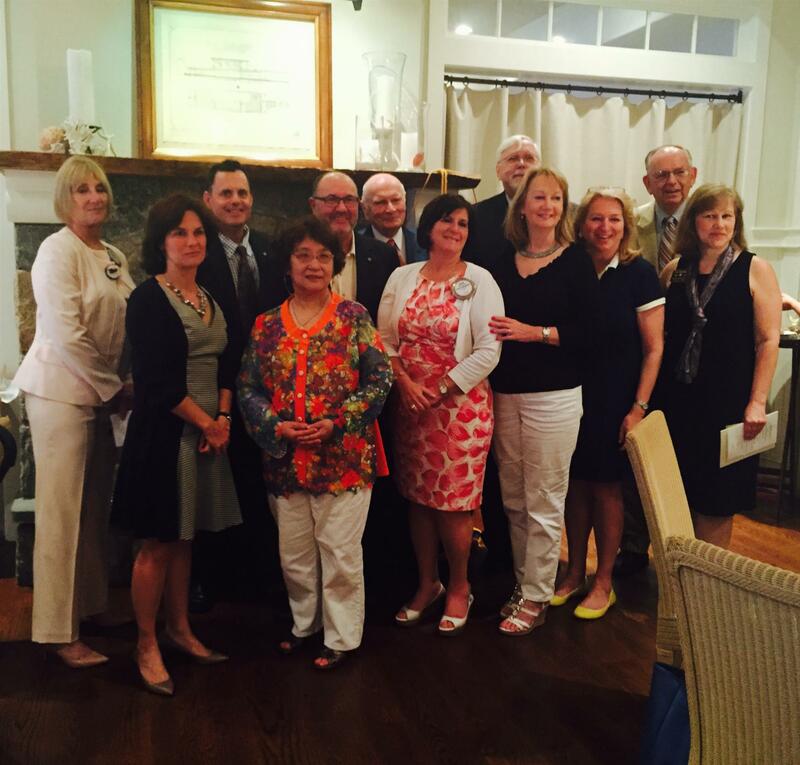 On June 20, 2013, at the 51st Annual Installation Dinner of the Rye Rotary Club, we were joined by members of the Portofino, Italy Rotary Club for the formation of Sister Clubs. Now along with the Courmayeur-Valdigne, Italy Rotary Club, we are all one big happy family! 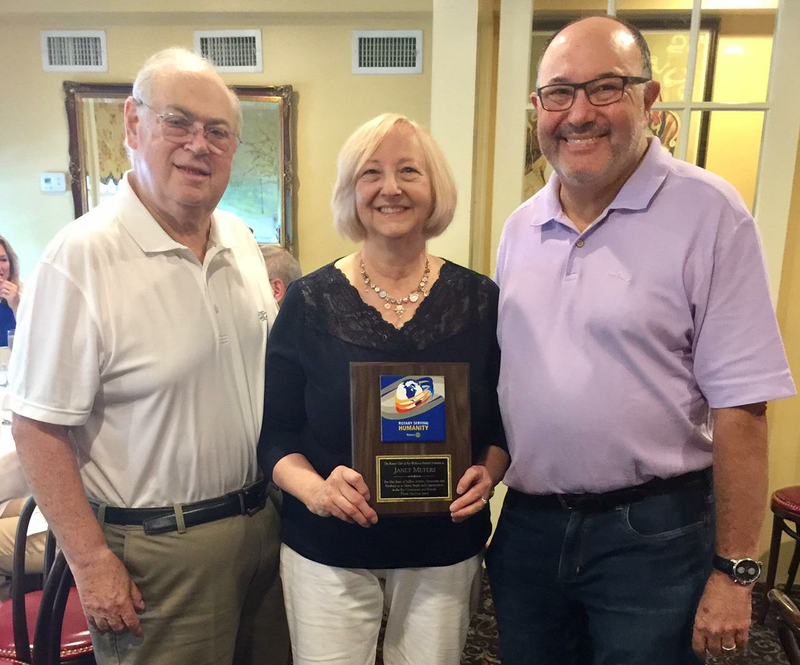 Special Thanks to Laura Hugelmeyer for spearheading our efforts to become Sister Clubs with the Italy Clubs and congratulations to the Incoming President Hal Schwarz and all Officers and Directors for the 2013-2014 year, which promises to be a great one! 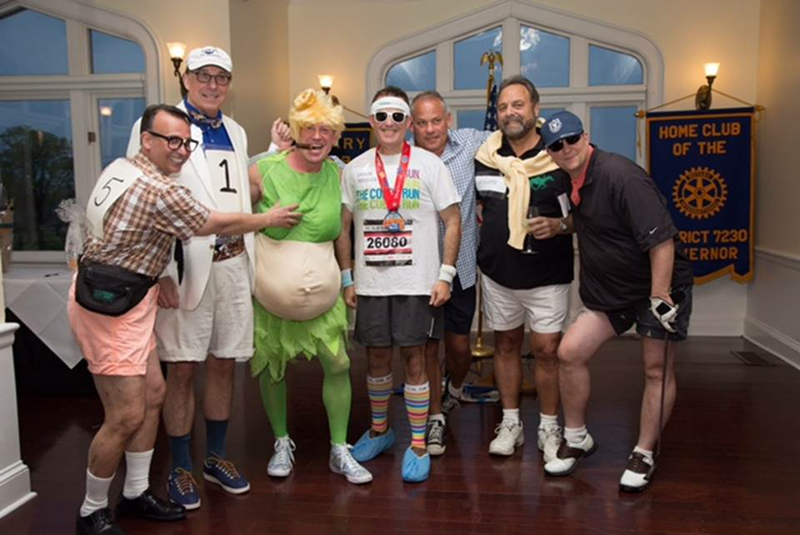 Please join us for the installation of our new Officers and Directors on Thursday, June 20th at 6:00pm at the Shenorock Shore Club, Milton Point, Rye, New York 10580. 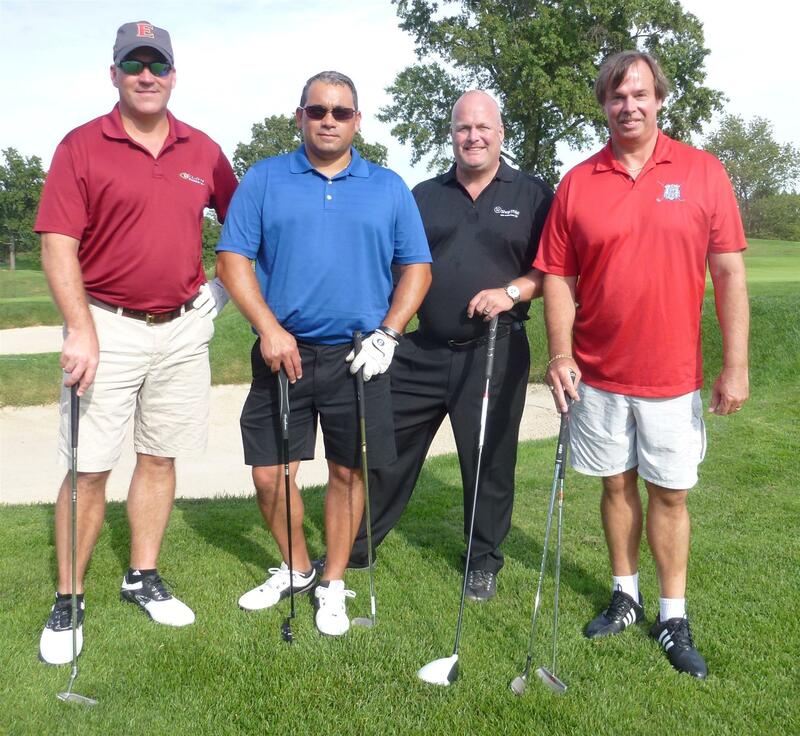 The cost is $50.00 per person, checks made payable to the Rye Rotary Club. Please RSVP to Melanie Ciraco at ciraco.melanie@gmail.com. 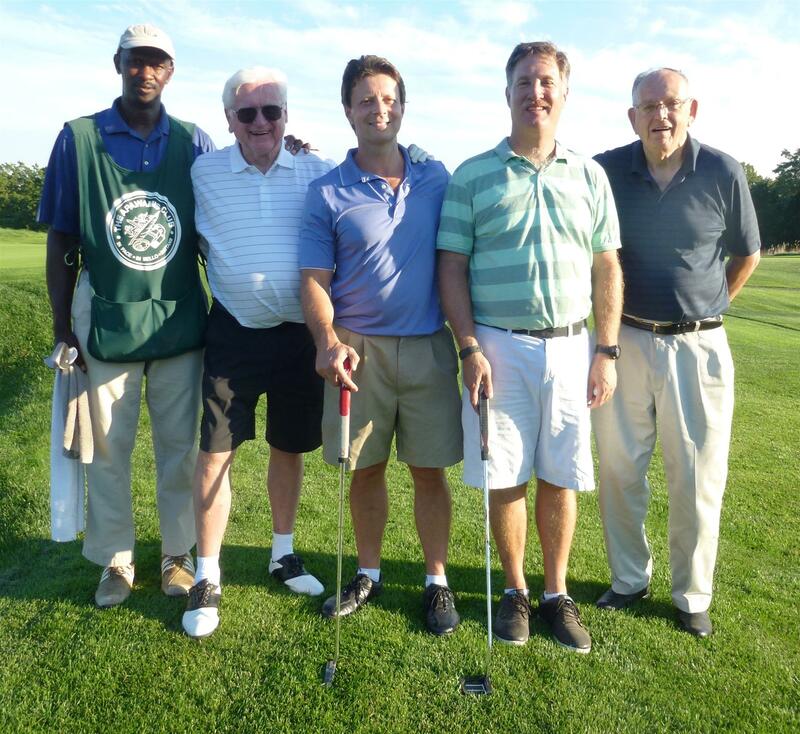 The Portofino Rotary Club members will be joining us as well! Friday June 21, 2013: Day Trip to Manhattan and afternoon with Melanie and Rick. More details to follow. RSVP to Melanie Ciraco as soon as possible! 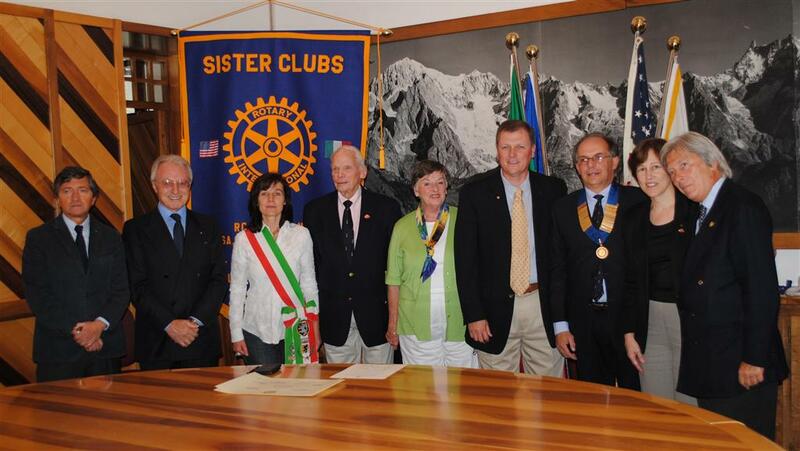 Rye Rotary and Courmayeur Italy Rotary Clubs become Sister Clubs! 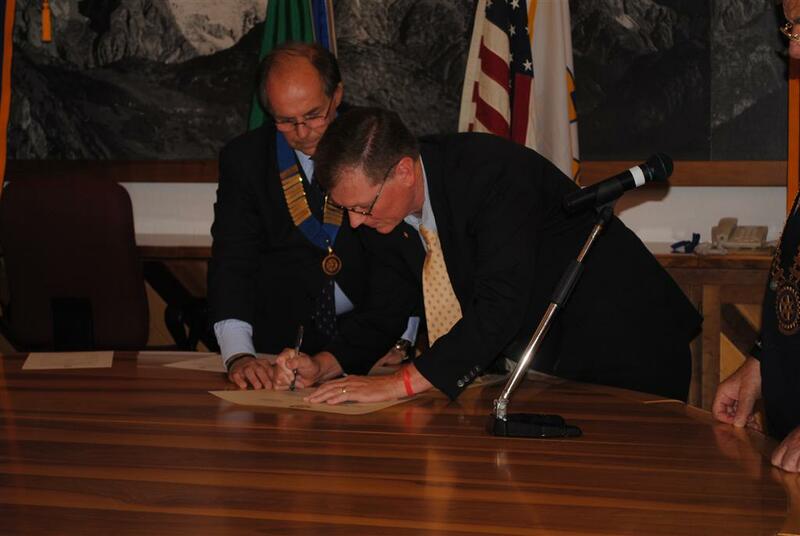 The Rye Rotary club became a sister club with Courmayeur, Italy when the members of both clubs signed an agreement on August 31, 2012 in the town hall of Courmayeur in Northern Italy. 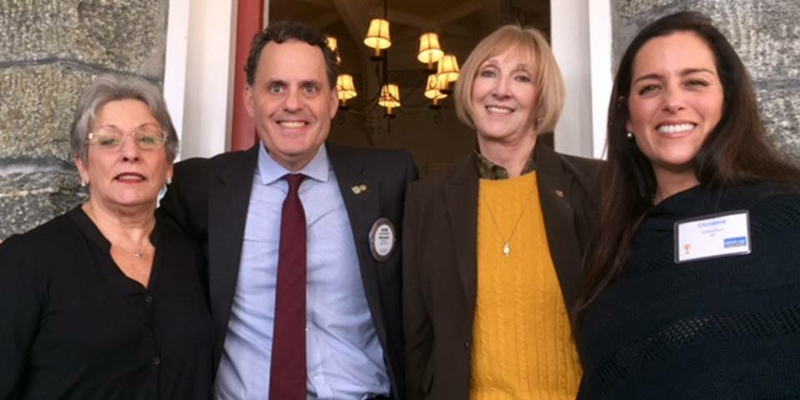 A small group of Rye Rotarians participated in the ceremony which was attended by their District Governor from Torino, Italy, the mayor of Courmayeur and many other dignitaries. President Scott Pickup, Past Pres. 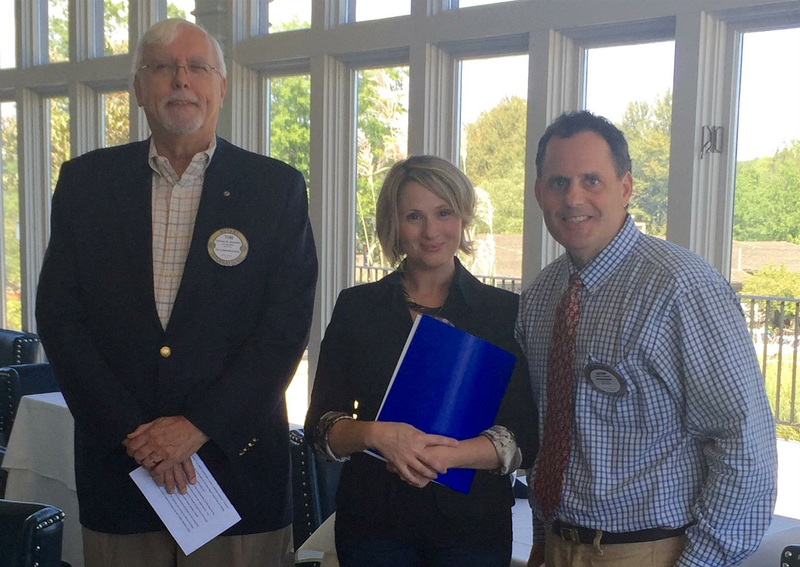 Lora Hugelmeyer and Coby Ellingwood represented Rye Rotary. The Rye members were treated with incredible hospitality which included delicious dinners, historic and cultural visits and sightseeing in their beautiful snow covered Alps. Rye is looking forward to hosting the Courmayeur Rotarians in appreciation for all they did for our Club.